One day can be a good example of how unpredictable and quickly changing the weather can be in the Lappish fells. 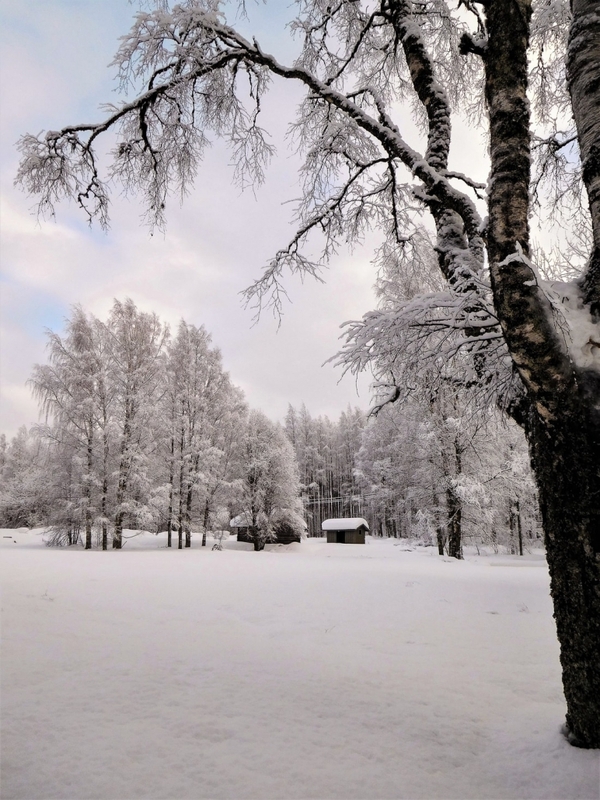 In an instant it can change from a freezing rainy fog to bright sunshine, and forenoon and afternoon can be totally different. 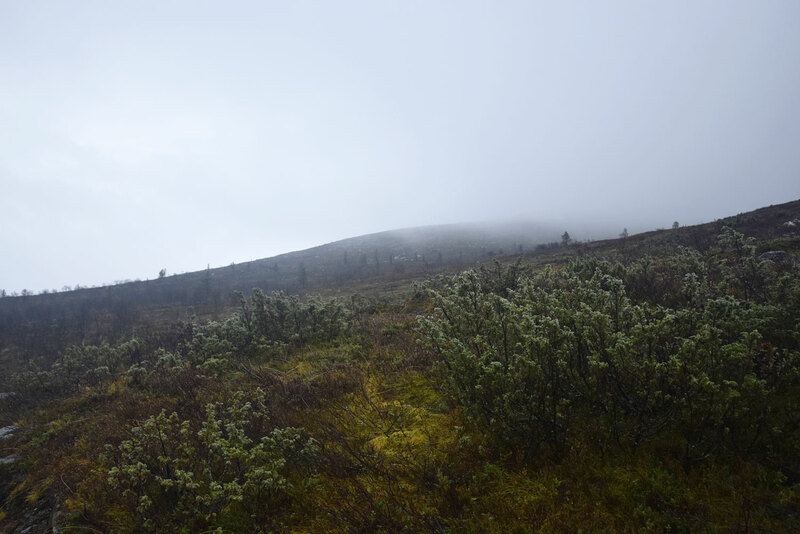 I started my day in an early forenoon of October as I climbed up the hillside in a rainy fog. 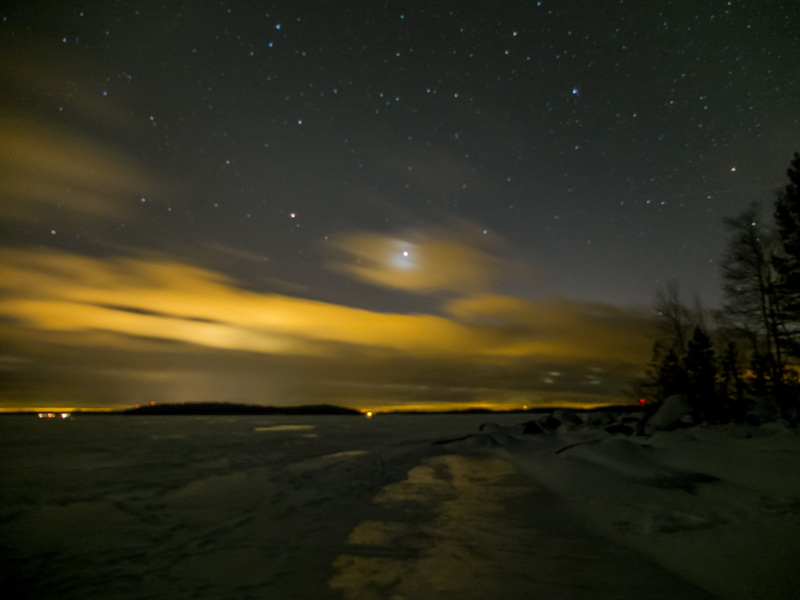 I could only see a few meters onward and the freezing drizzle made me cold in no time. Nevertheless, I enjoyed my time in the silence and taking some pictures. 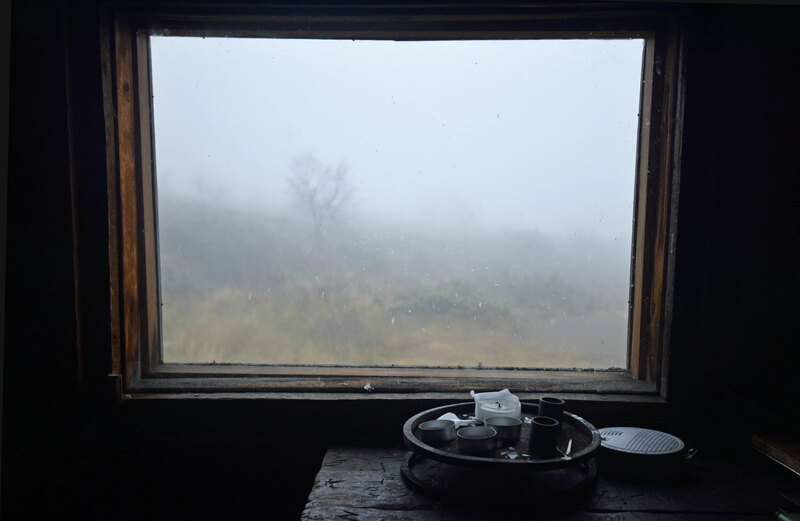 As I reached the wilderness hut I got inside to warm up and get dry. 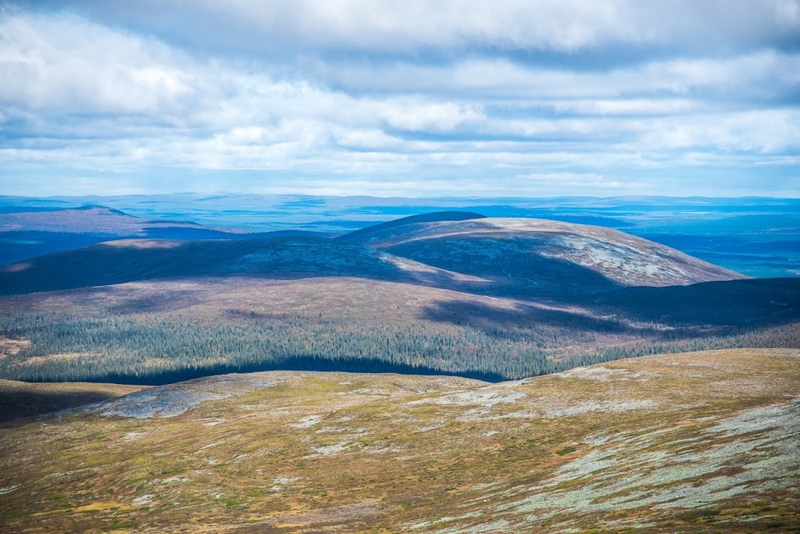 In Pallas-Yllästunturi National Park there is a 60 km route from the village of Hetta to the nature center in Pallas fell. 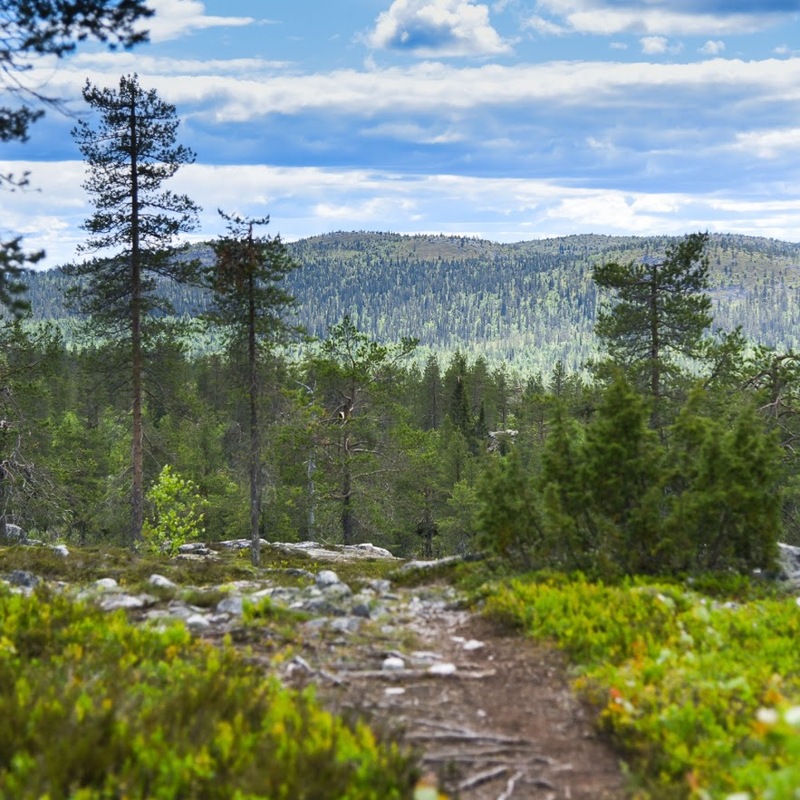 The trail is quite popular especially during the summer and early autumn. It is also possible to reach the trail and the fells of the national park as a day trip. 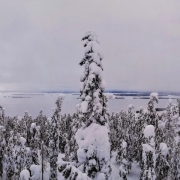 I made this trip starting from Vuontisjärvi and climbed up to the fell and to the wilderness hut called Montellin Maja. The wilderness hut Montellin Maja looming ahead. 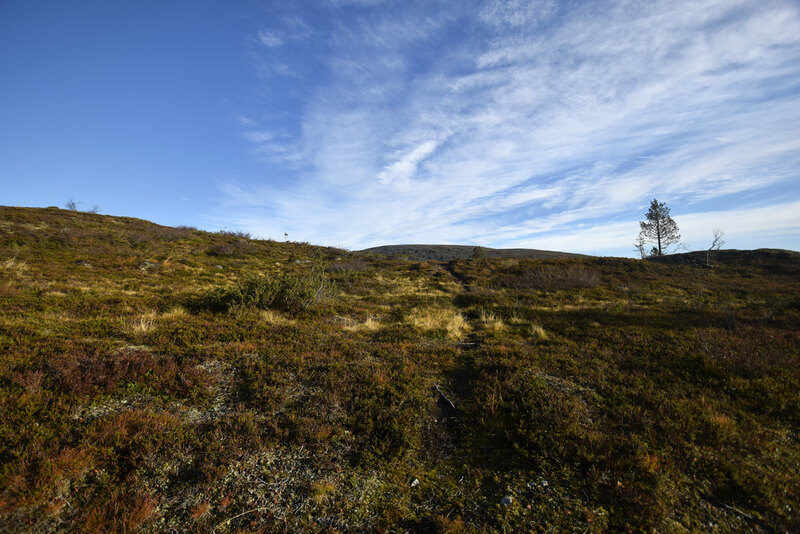 The route from Vuontisjärvi up to the cabin is not long but it is really steep so it will challenge your strength. 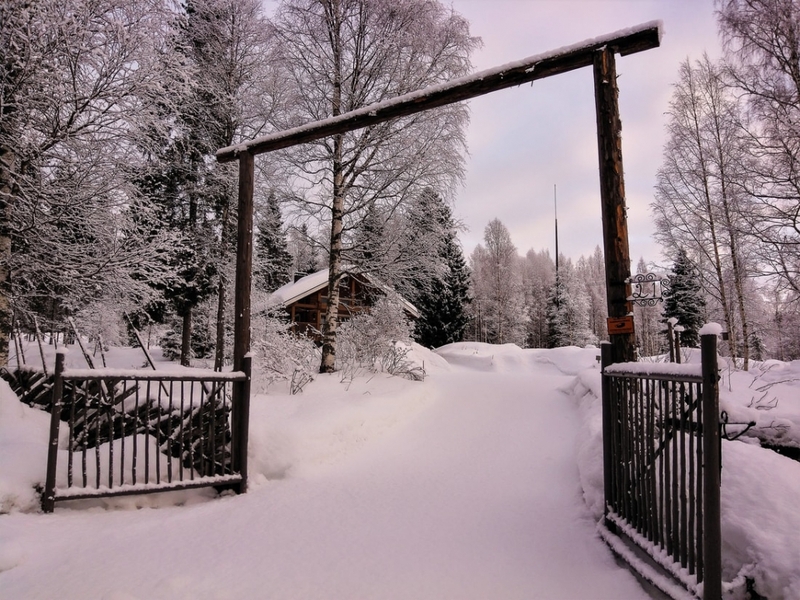 Open wilderness huts are for hikers and skiers to have a rest or one overnight stay. They are usually located in roadless backwoods of Northern and Eastern Finland. 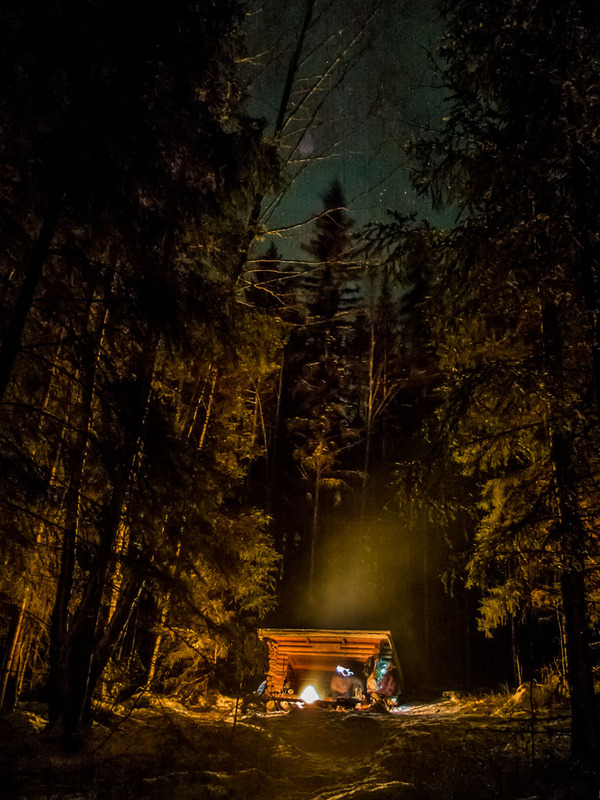 Open wilderness huts are free to use for shelter and for 1-2 night stays, when you are hiking in the wilderness. Just remember a few important rules and you too can enjoy them! 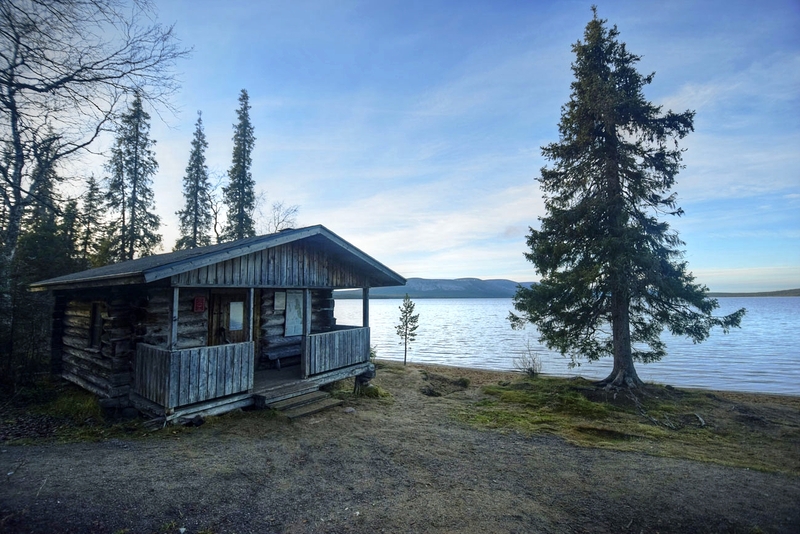 Open wilderness huts are free to use, but you can not reserve one for yourself. 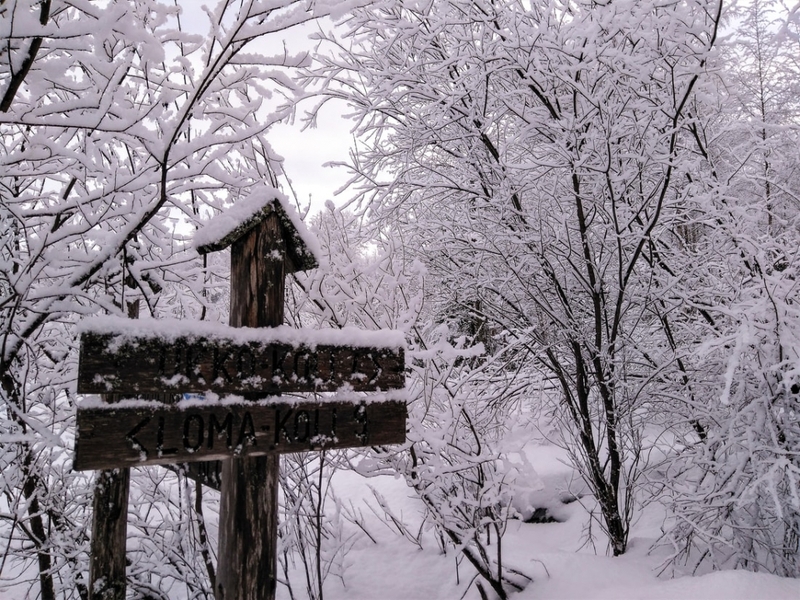 So keep in mind that you can not plan a hike thinking that you will only use these open cabins. 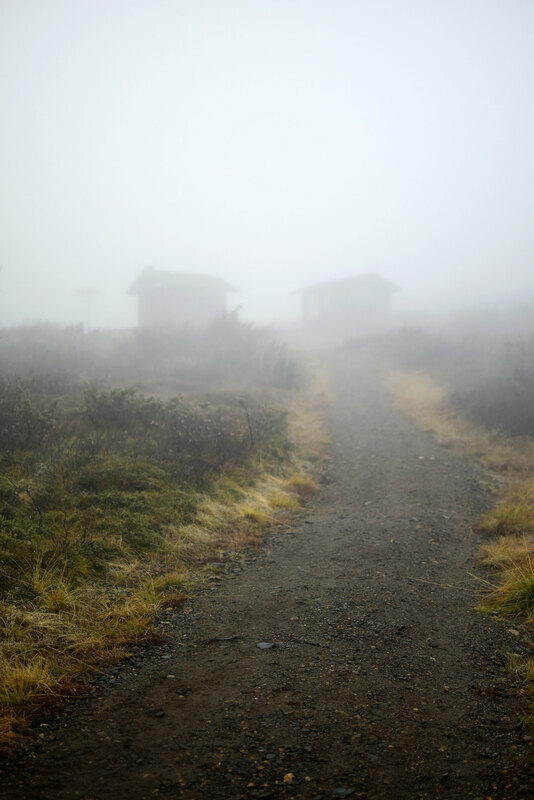 In case there are other hikers arriving after you, you must let them in and make room for them. This can mean that you have to sleep outdoors. 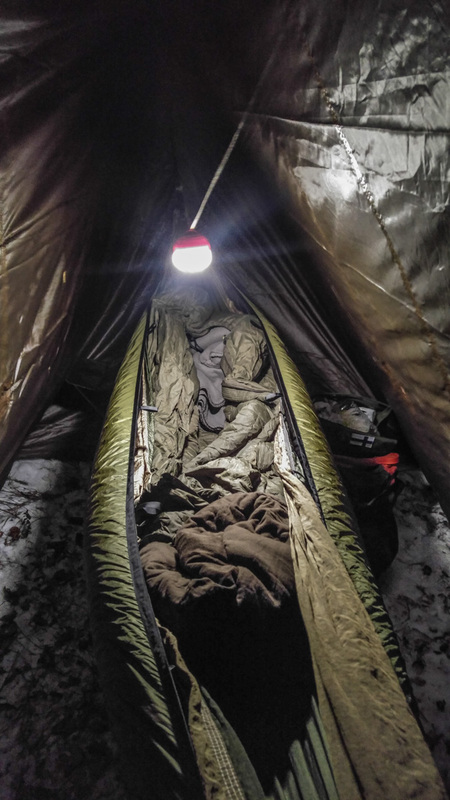 This is why you must always have an alternative shelter (for example a tent) with you. 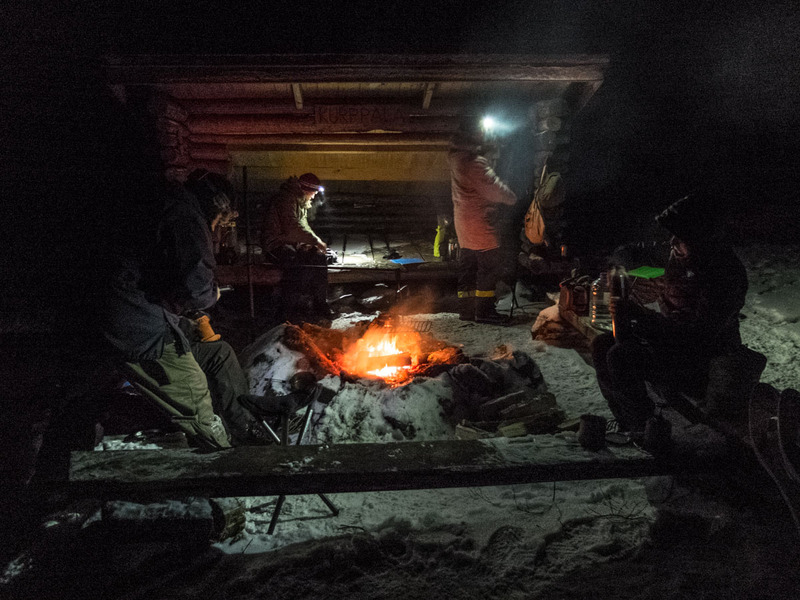 This, of course, is also a safety issue – you might get lost or be too tired to walk to the next hut, so it is good to have some kind of shelter with you. 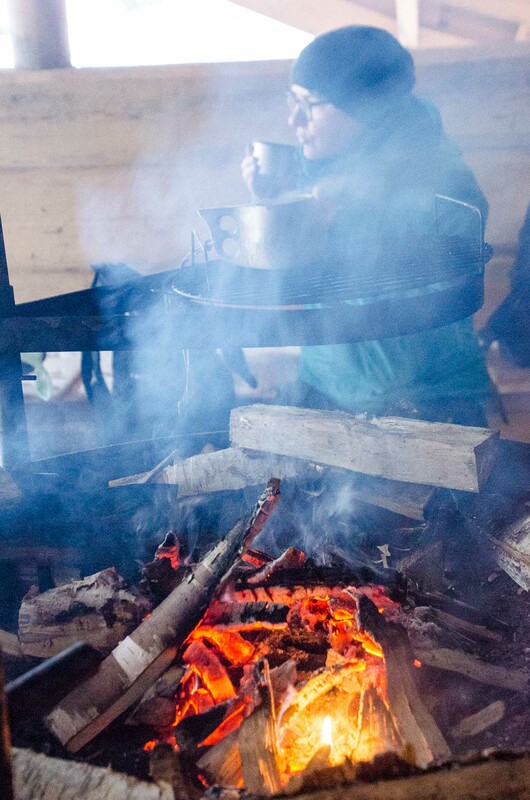 Always leave the hut in same or better condition than it was when you arrived. In general, keep everything tidy and be mindful for others. 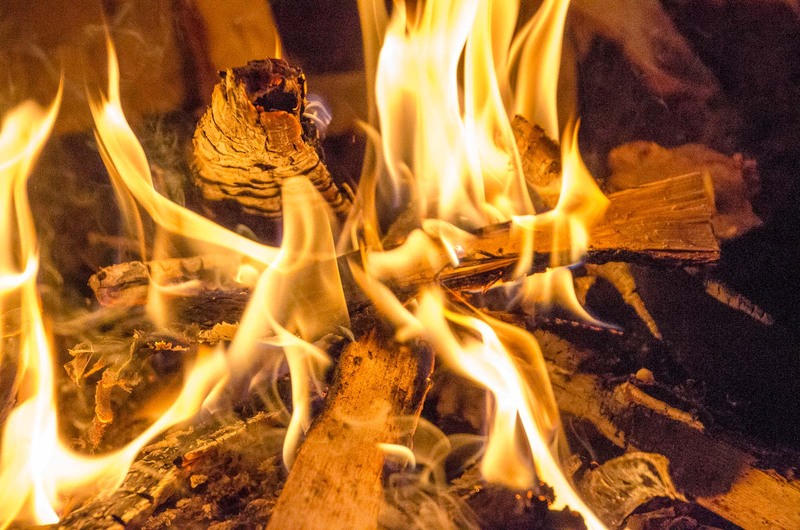 Before you leave, make some fire wood ready for the next hiker. 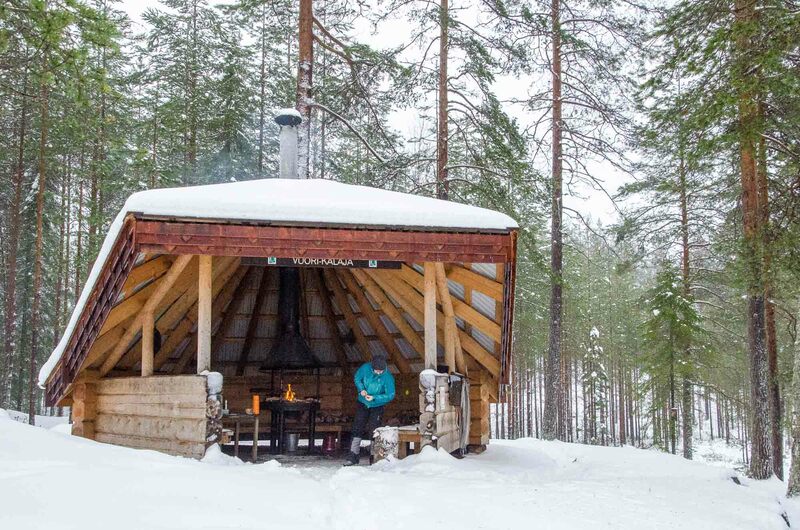 Read more about the Finnish wilderness huts here. 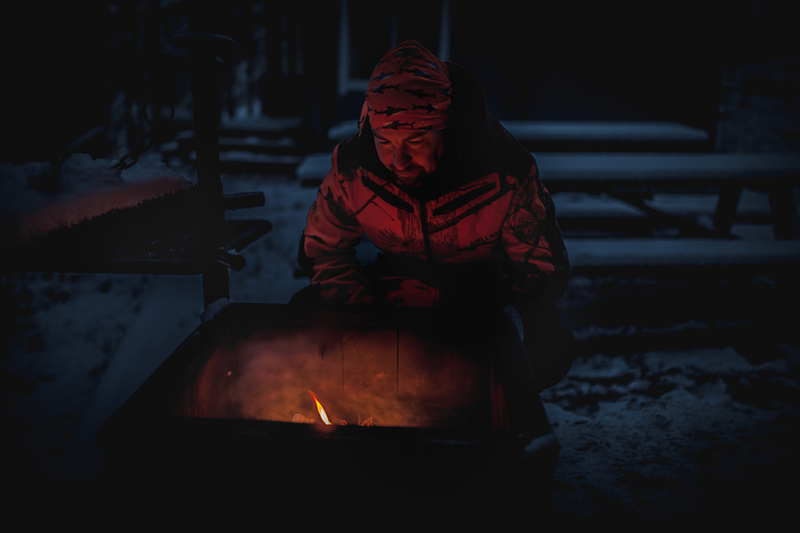 You can also find there information about every open wilderness hut in Finland, where they are and how they are equipped! There is also a possibility to reserve specific reservable or rental huts. These can be found in some hiking areas and national parks, and there is usually some kind of a fee. Also about this you will find information from the link above. After my break in Montellin Maja, the weather started to clear up. It was supposed to be clear the whole day according to the weather cast, but you’ll never know. Anyway, I was glad to finally see what the surroundings actually looked like! 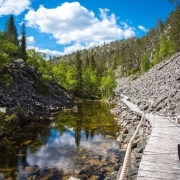 The trail from Montellin Maja to Pallas is about 15 km long and will pass the highest point of Pallas-Yllästunturi Nationalpark in Taivaskero. On the afternoon the sky got clear and I got to enjoy the sunshine! 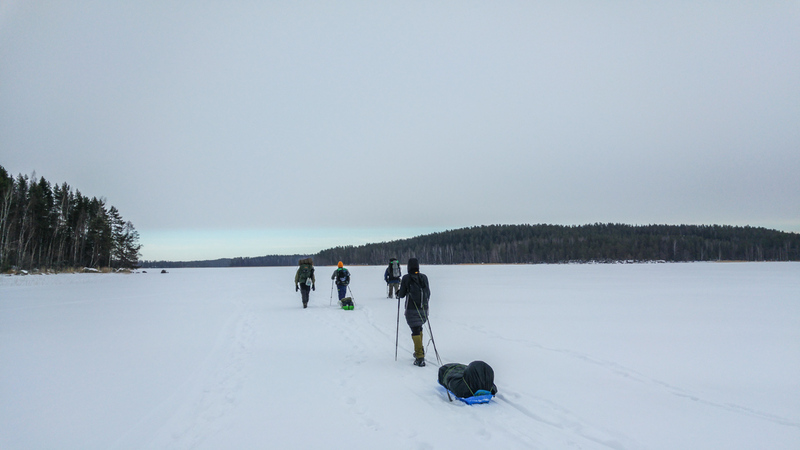 For the evening I headed up to the Punaisen Hiekan Autiotupa which is another wilderness hut, located by the lake Pallasjärvi. The name literally means “hut of the red sand”: the sand of the beach really has a rusty red color. This place also has the perfect view towards the fells of Pallastunturi. 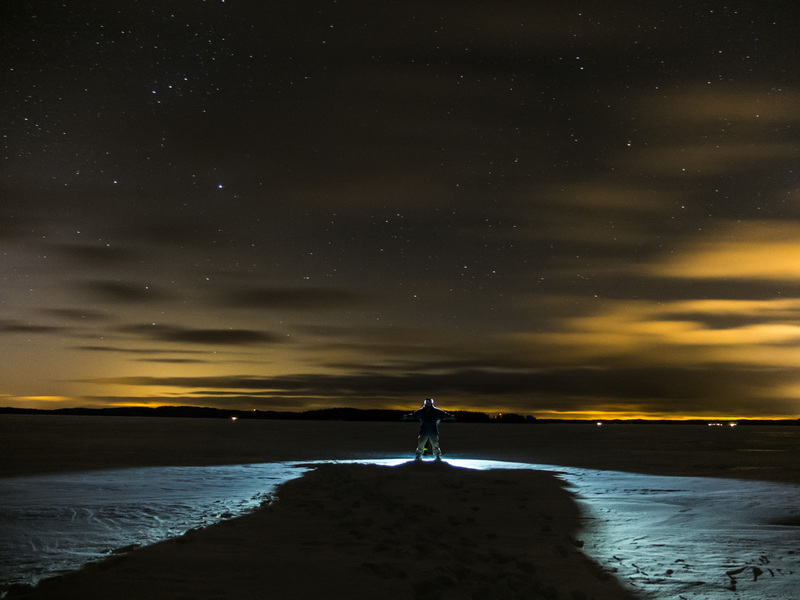 I can imagine how spectacular the view would look during a northern light storm in winter! 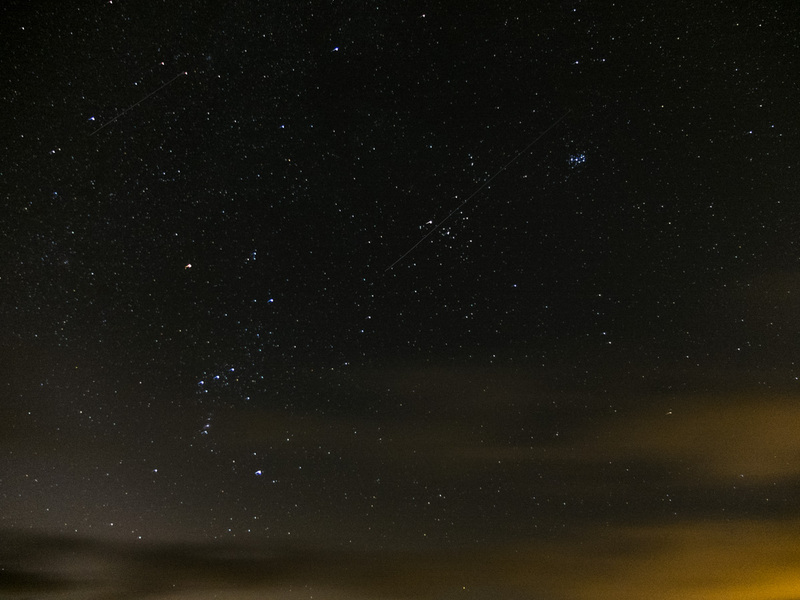 Actually I was curious if I’d see some auroras that night, but then the sky went cloudy again. 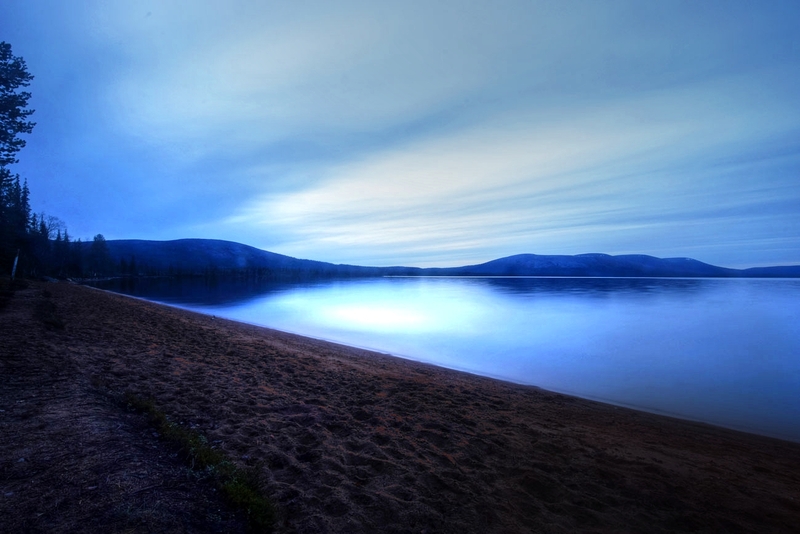 Everyone I know has some kind of a ‘soul landscape’ – a landscape in which they feel they truly belong. 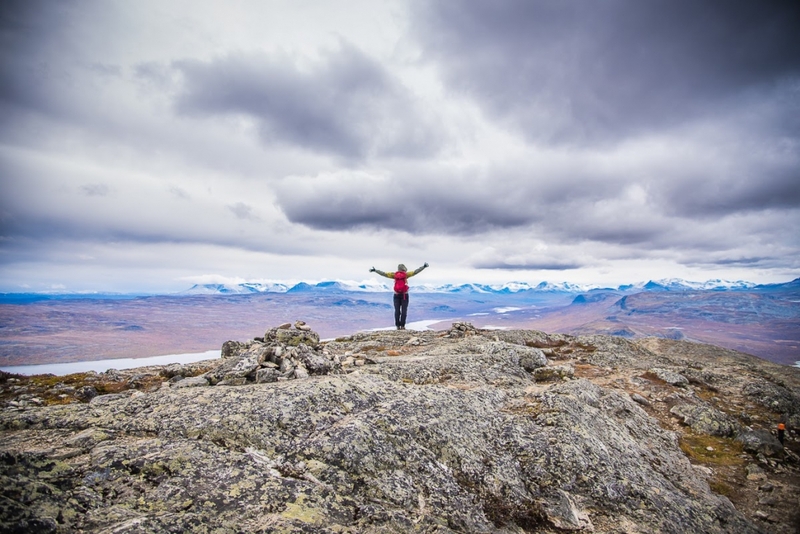 I know people who feel at their most alive in mountains. I know many, who feel most at peace resting on a green bed of moss or wandering in the woods. 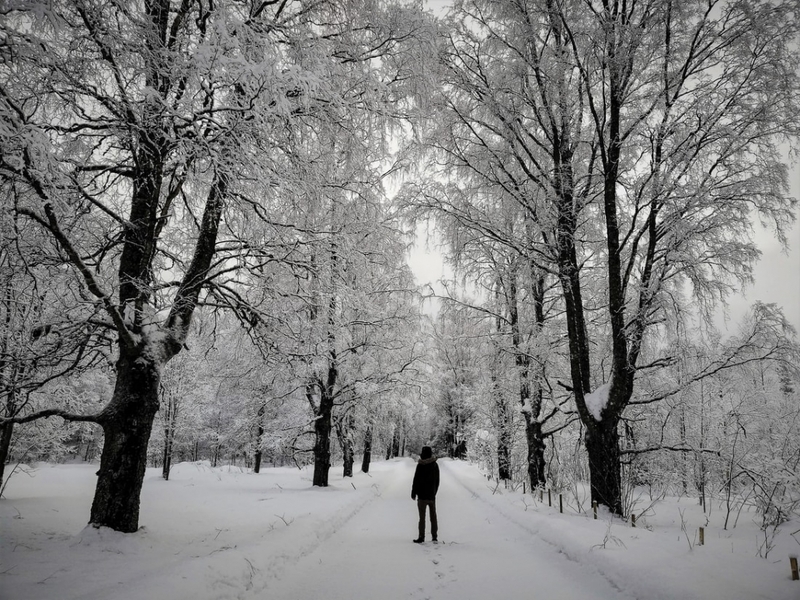 My heart beats stronger and steadier than ever when I’m in the archipelago of the Baltic Sea. 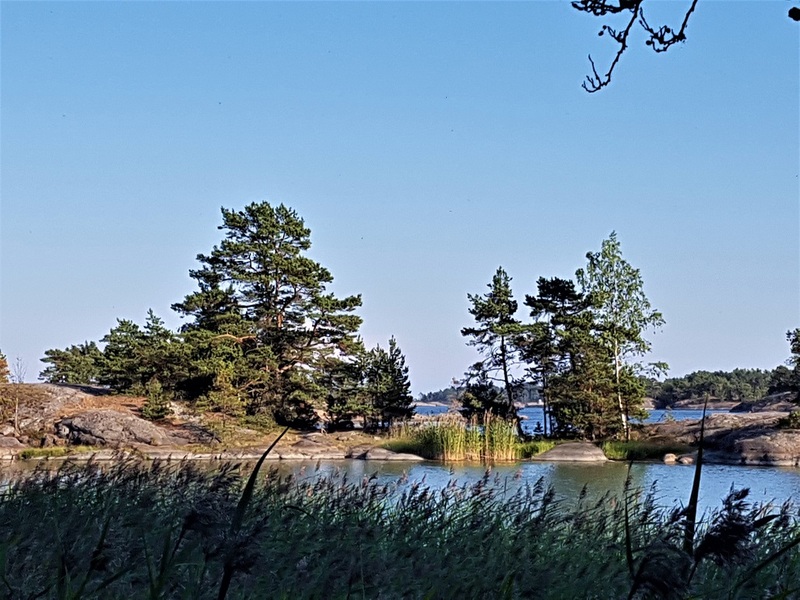 Ekenäs Archipelago National Park includes lush coastal inner archipelago as well as more rocky and exposed outer archipelago right up to Jussarö lighthouse. 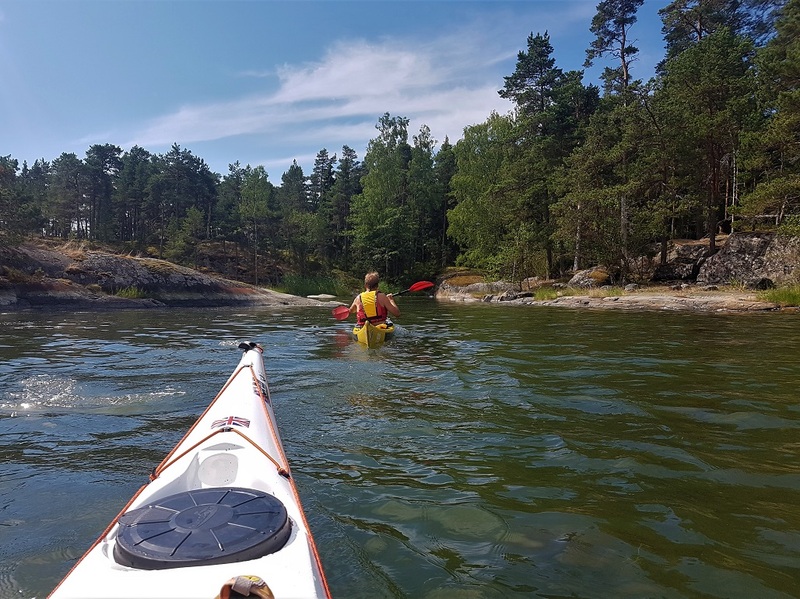 Ekenäs Archipelago National Park is a great paddling location. 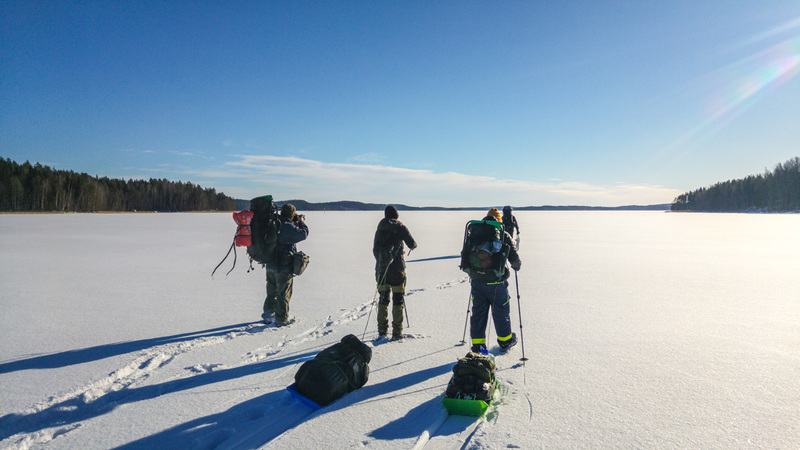 There’s enough to explore for a multi-day trip, but if you’re pushed for time, a lot can be packed into two days. My friend and I decided on a two day route that took us around three islands. 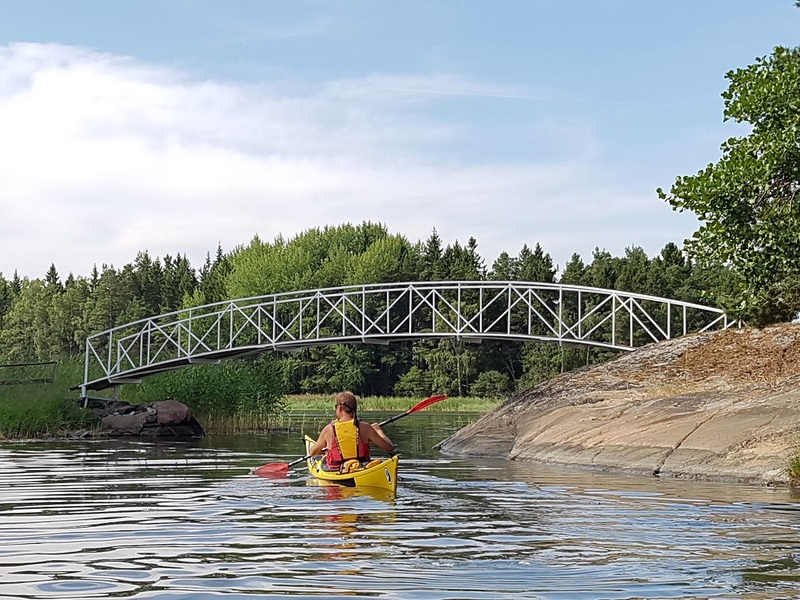 If you’ve completed a paddling course and want to try sea kayaking for the first time, Ekenäs Archipelago National Park is the perfect place to start. Our three island tour is relatively easy to navigate with a sheltered route but all the atmosphere of sea kayaking – the feeling of distance, wind and waves. If for any reason you need to suddenly get to shore, land is never far away. 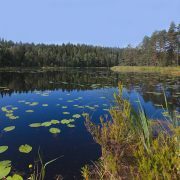 Ekenäs Archipelago National Park’s 52 square kilometres is made up of many islands, big and small. 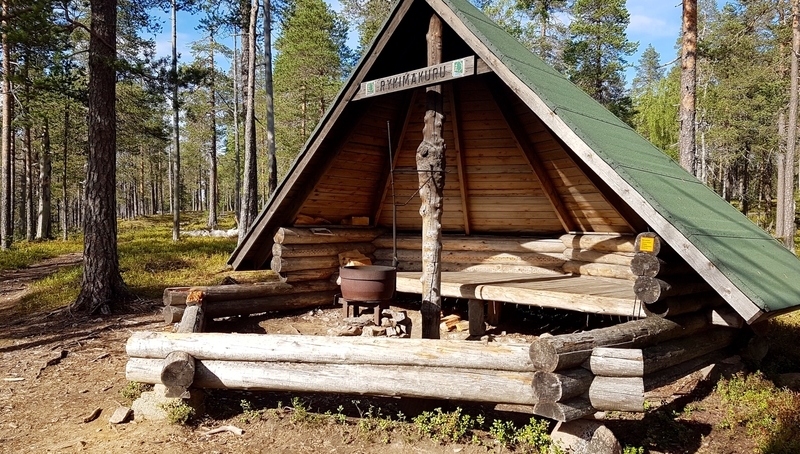 We chose the inner coastal islands of Älgö, Fladalandet and Mordemagan, which provided the most sheltered route, as well as services to make camp life easier, such as dry toilets and designated campfire and tent sites. Another thing that helped make up our minds was access to marked nature trails, so that we could go stretch our kayak-cramped legs. 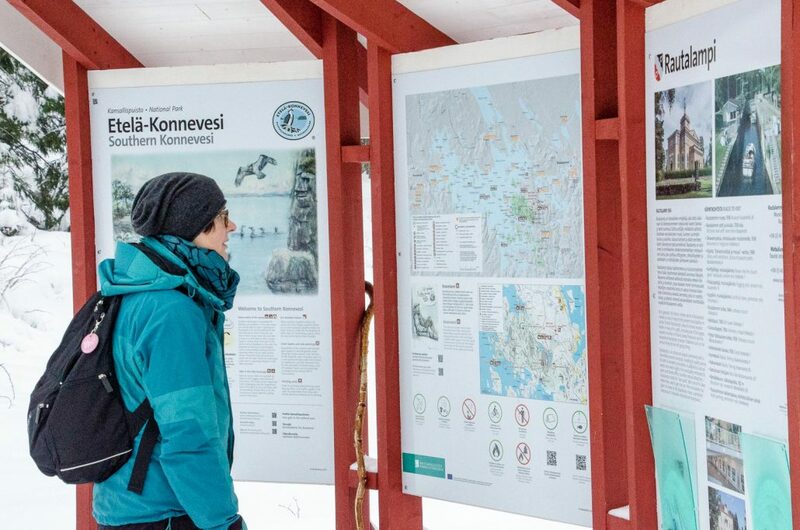 A map of the overall area is available for download Metsähallitus’s Outdoor.fi page. 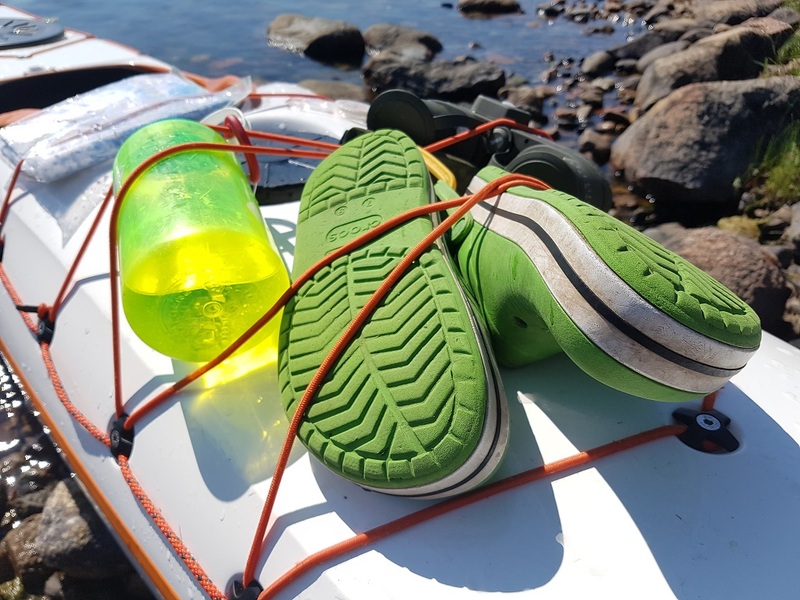 A strong and experienced paddler could complete our three island tour in one day – the route’s length is around 20 kilometres with 4-6 hrs of total paddling time, depending on paddling speed and wind. However, we wanted to paddle at a relaxed pace, spend the night in the national park and enjoy peaceful island life, so a two day trip suited our needs better. 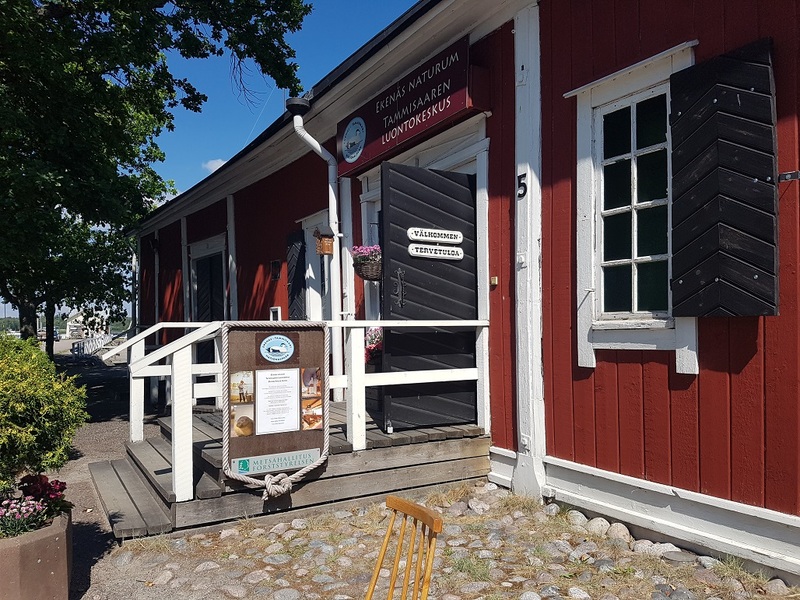 Before heading out to sea, we went to the national park’s nature centre, which is next to the guest harbour, to absorb some of the archipelago vibe. 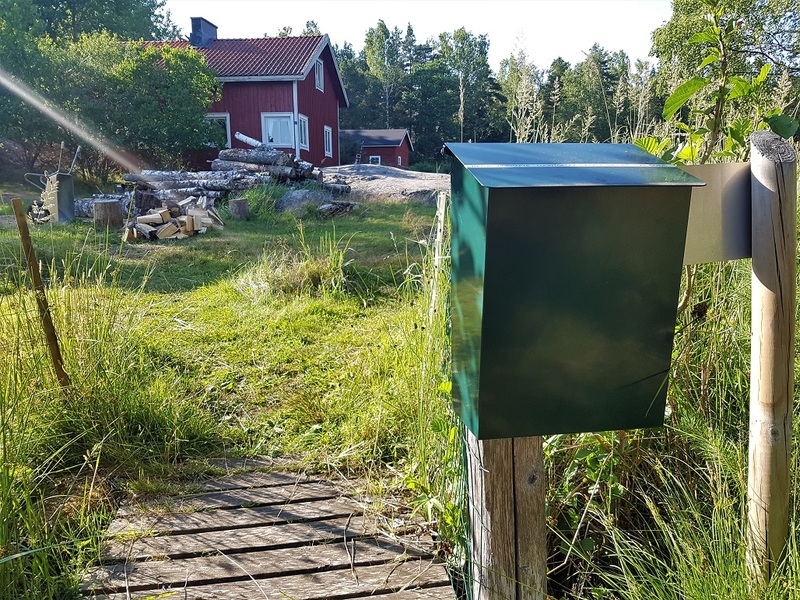 The exhibition, which tells you about archipelago life and nature as well as protection of the Baltic sea, is primarily designed for children, but there is plenty for adults to learn too. Near the entrance you can pick up a more general map of the national park, which we took along as a spare. A good departure point for a kayaking trip is Sommarö Stranden, which is actually 13km from Tammisaari. 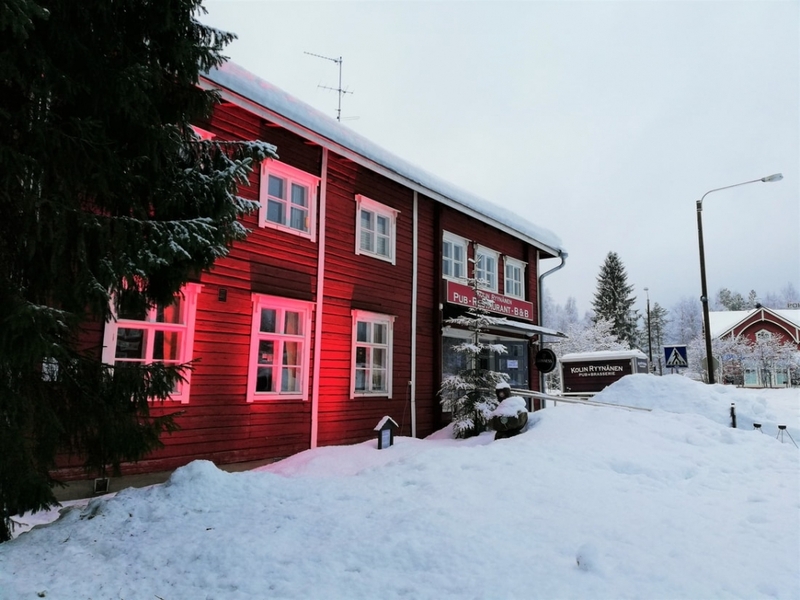 There’s a restaurant and a small shop, if you want to have something to eat before heading out or have a last minute panic about having packed enough food. 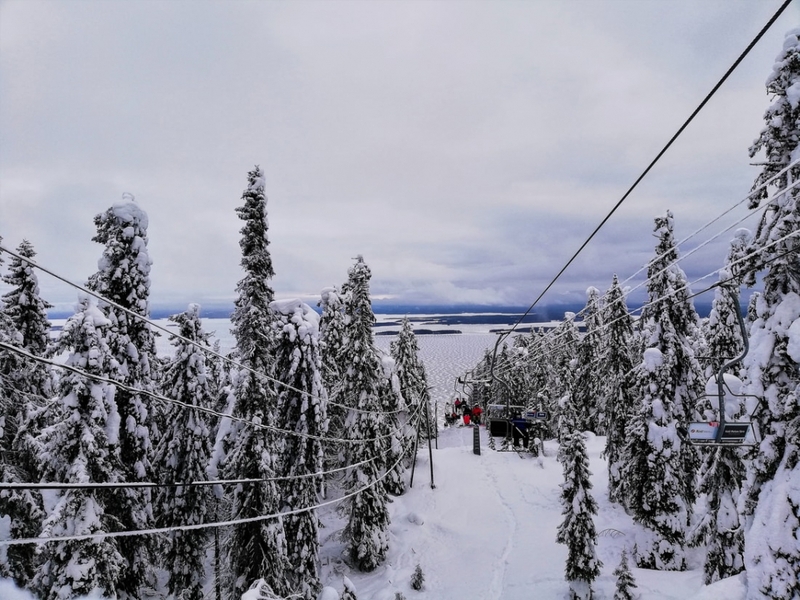 There’s a small stretch of beach, as well as a concrete slope, from which kajaks are easy to launch into the water and you can leave your car at the guest harbour. The three island tour can be done clockwise or anti-clockwise. Check the weather forecast and wind direction before choosing which way to go. 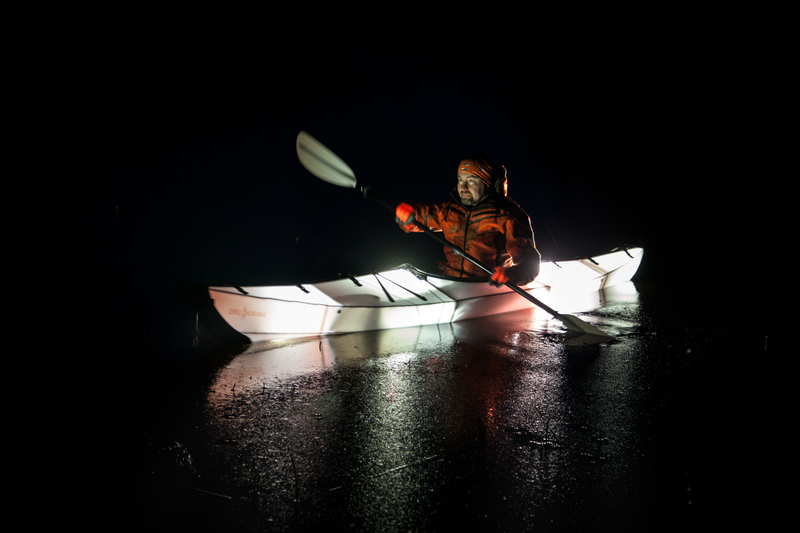 Even though the route follows a sheltered route between islands, the wind can still have considerable impact on your paddling. 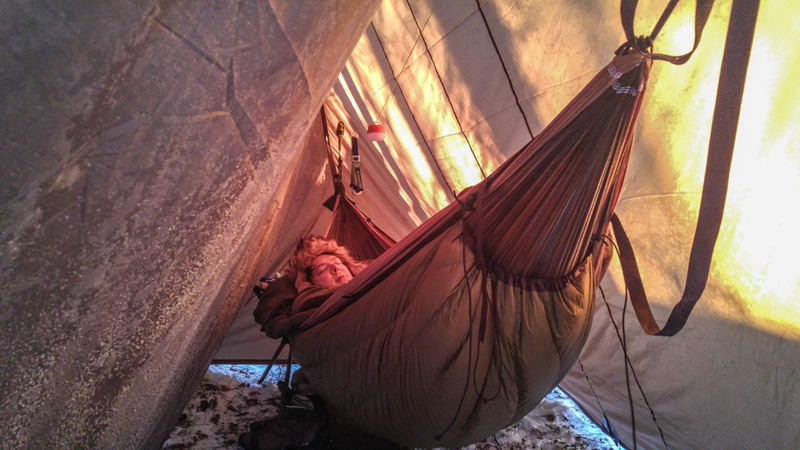 And if you want to sway in a hammock at night, make sure you check which islands have trees and which side they’re on! From Sommarö Stranden we decided to paddle around Älgö island anti-clockwise, aiming for Rödjan fisherman’s hut and the starting point for the nature trail. We were accompanied by an easterly wind and the island sheltered us for the first part. After paddling for an hour, we stopped, carried the kayaks onto the rocks, had something to eat and drink and went for a swim. We navigated with the help of a marine map and an app on our phones. My friend had the nature centre’s free area map, which is not detailed enough for navigation on its own, but is helpful if you want a quick overview of where you are in relation to the rest of the national park. 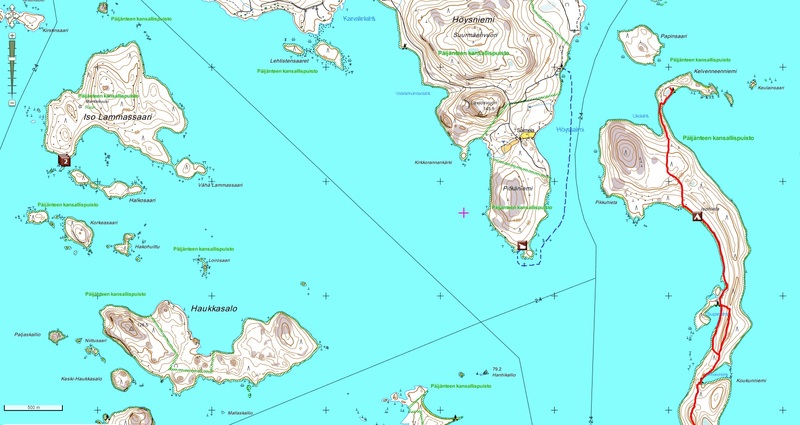 Mostly we followed the coast of Älgö, but after the stretch of water marked as Mörnsfärd on the island’s north west side, it makes more sense to go around the west sides of Heimosholmen and Halsholmen. 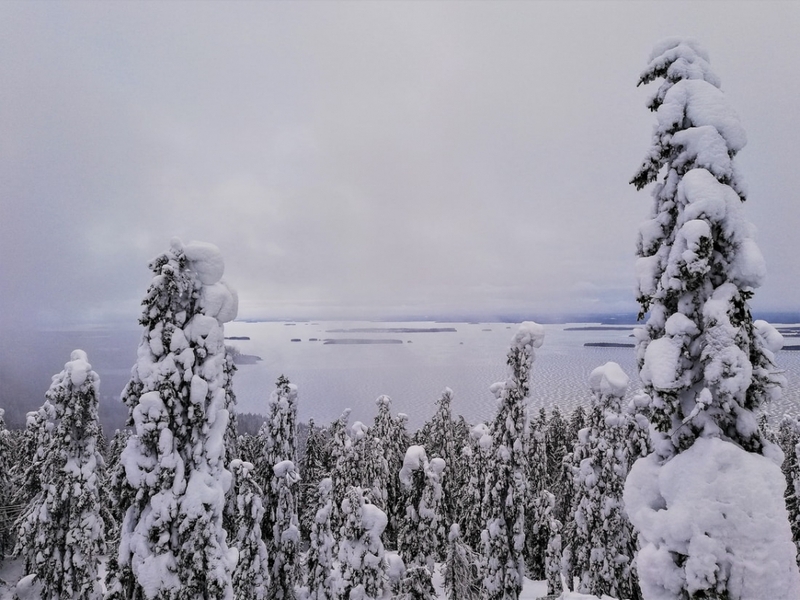 Even though the coastal inner archipelago is mostly sheltered and relatively safe, remember that you’re still at the mercy of the sea and the elements. The weather and direction of the wind can change suddenly and visibility can drop to nothing. 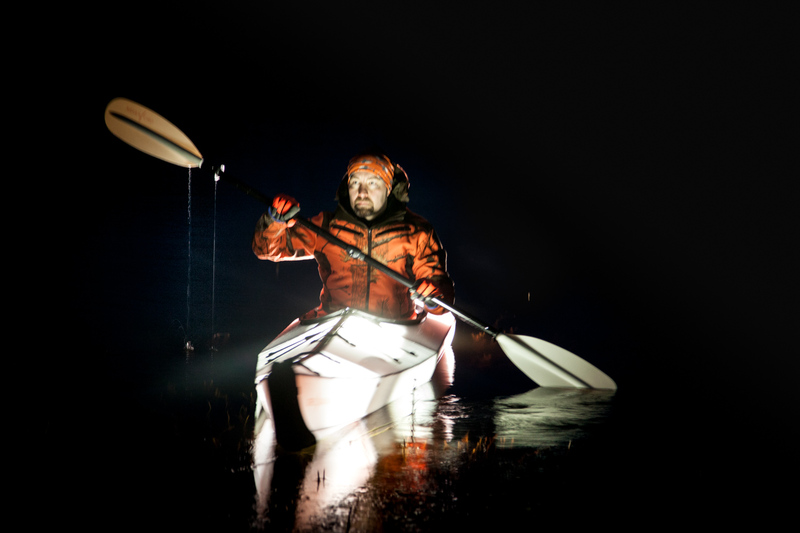 This is all worth keeping in mind even on an easy, relaxed paddling trip. Make sure you always know where you are on the map. The route crosses a few boat channels, so be aware and careful of fast-moving boats and the waves that they create. 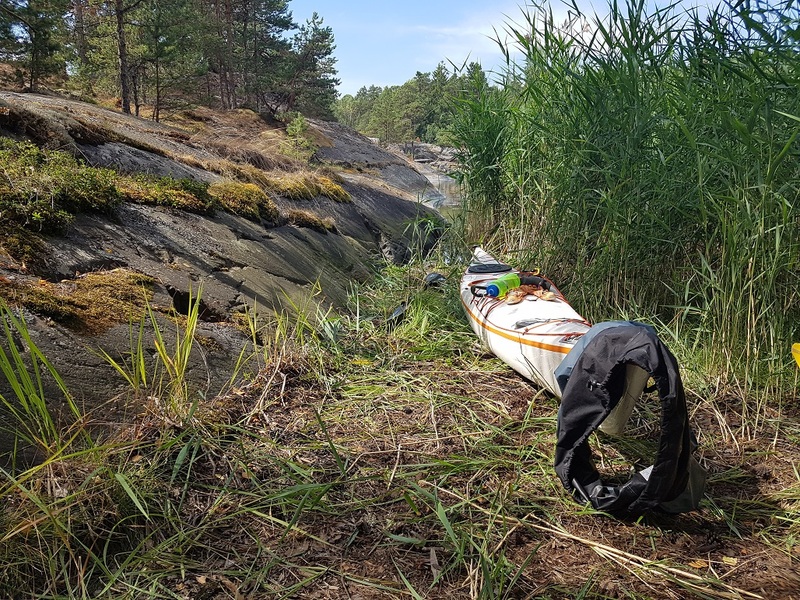 After about 2,5 hours of paddling, we reached Rödjan. 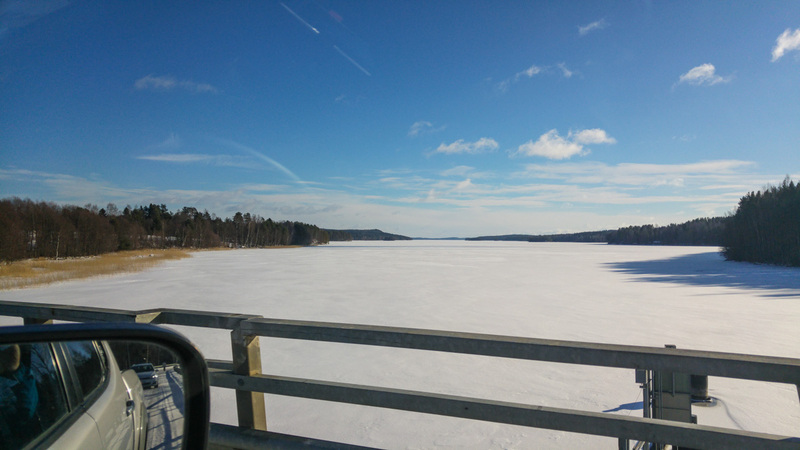 The journey was about 10 km. By the time we arrived, we were already hungry and also quite tired. At the guest harbour there were a couple of beautiful wooden sailing boats and a larger motorboat at the fisherman’s hut. There were a couple of places for kayaks on the right hand side of the fishing hut, on the beach in the nook of the rocks. After we had already spread out our picnic, we realised that we had picked a bad spot, right in the middle of the nature trail’s starting point! In the postbox at the beginning of the trail, there’s an interesting information pamphlet that tells you about the island’s history, which you can borrow while you walk. 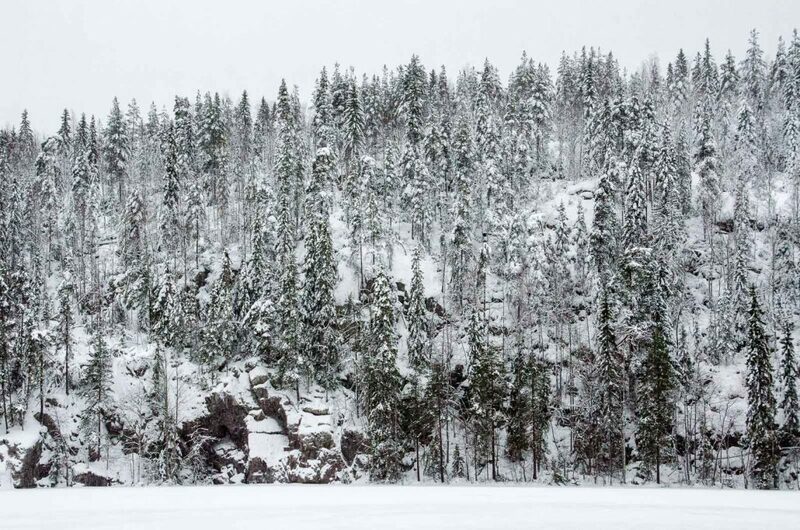 For thousands of years, Älgö lay under continental ice, and then water until the land rose. Seals have lounged about on the low outer islands, which have over time become Älgö’s high rocks. 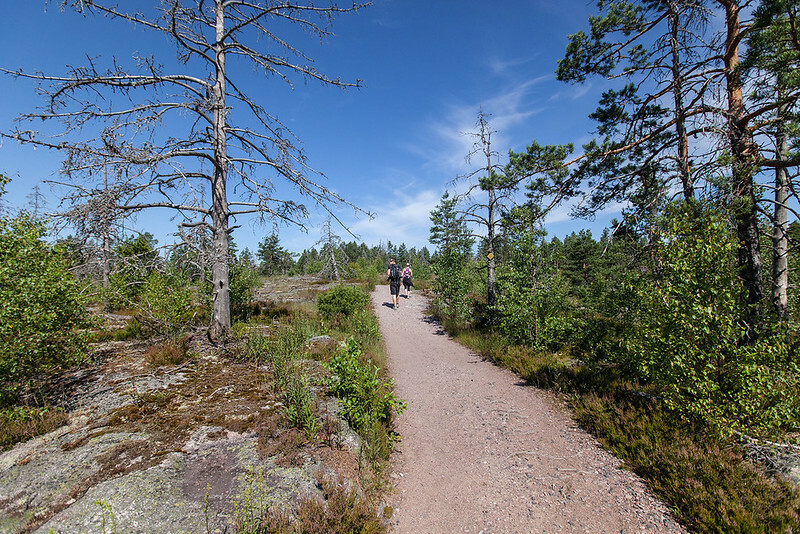 Älgö’s nature trail has a lot of steep climbs and descents. 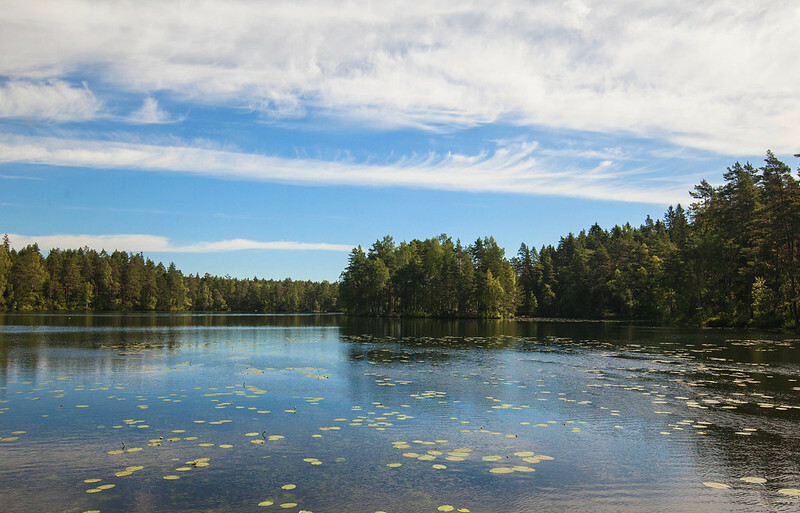 Along the route you can see many bays which become overgrown, different forest types and Älgö’s inner lake. 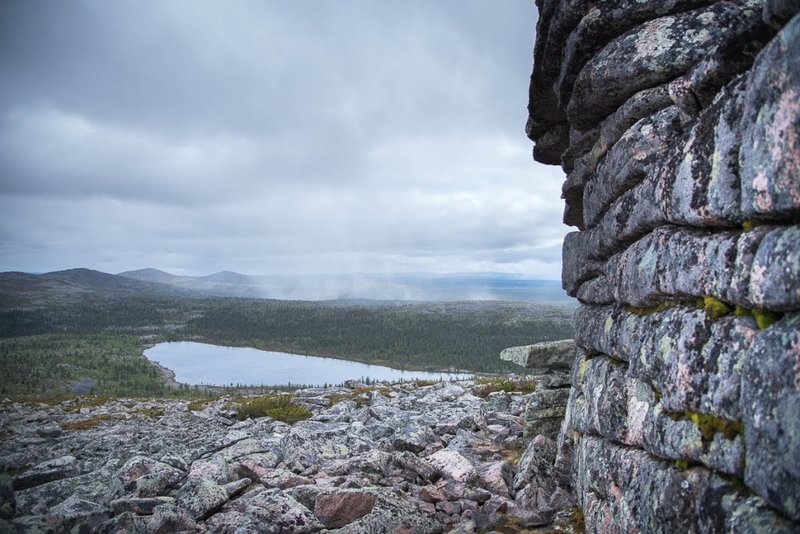 Only half a kilometre along from the starting point is the observation tower, with a view that stretches out across the national park. 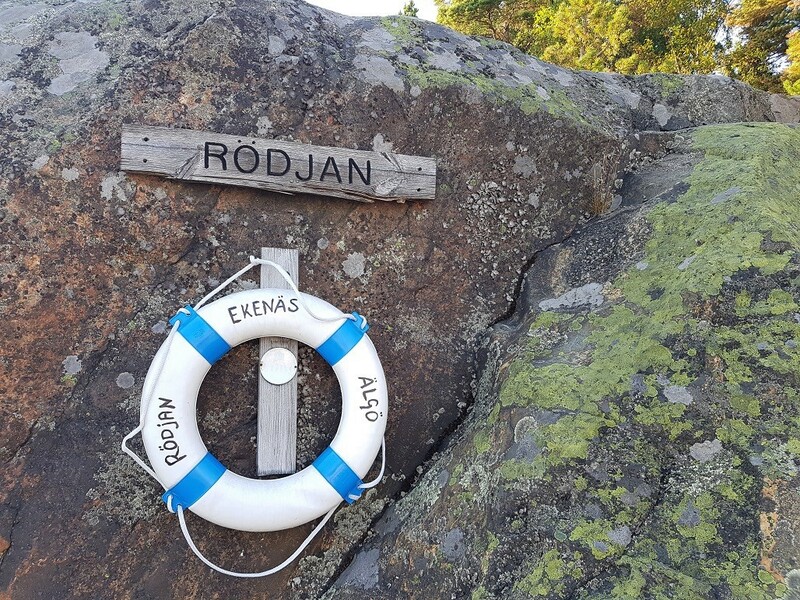 After an hour we arrived back at Rödjan’s fisherman’s hut and thought about whether we should continue to the next island. 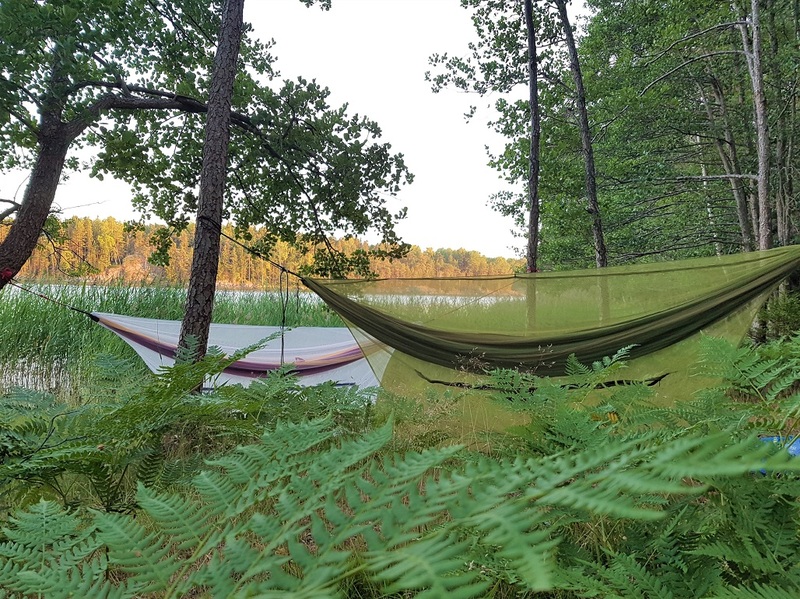 But the evening was drawing in and the idea of getting into our hammocks felt much more appealing than that of paddling. We found the official camping spot on the left of the guest harbour (looking out to sea). The rays of the evening sun danced on the ferns on the leaves, and water lapped on the rocks. 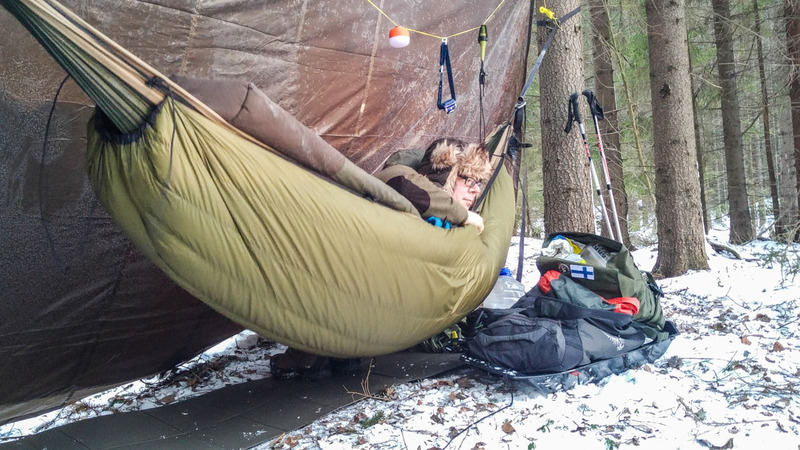 This spot had good places for tents as well as perfect trees for hammocks, so the decision was made quickly. We moved the kayaks to a different beach, hung our hammocks in the trees and had strawberries and cream for our evening snack. We enjoyed our breakfast in the sun on the rocks, about 50 metres west of our camping spot. 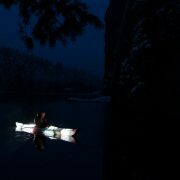 After packing our kayaks, we navigated towards Fladalandet, which was just under an hour’s paddling away. 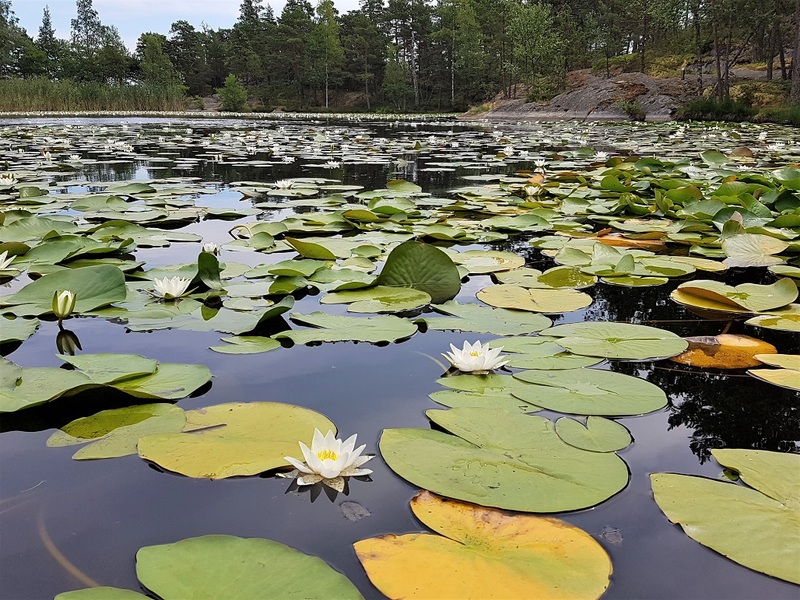 Even though we didn’t go ashore, it’s definitely worth paddling around Fladalandet! On the northern edge is a natural harbour and lots of narrow bays and coves that go deep into the island which can only be reached by kayak or paddleboard. I recommend going to explore each one, for they are all different and interesting in their own way. In windy weather, Fladalandet’s bays provide many sheltered places to come ashore. On Fladalandet’s south side, is open sea. 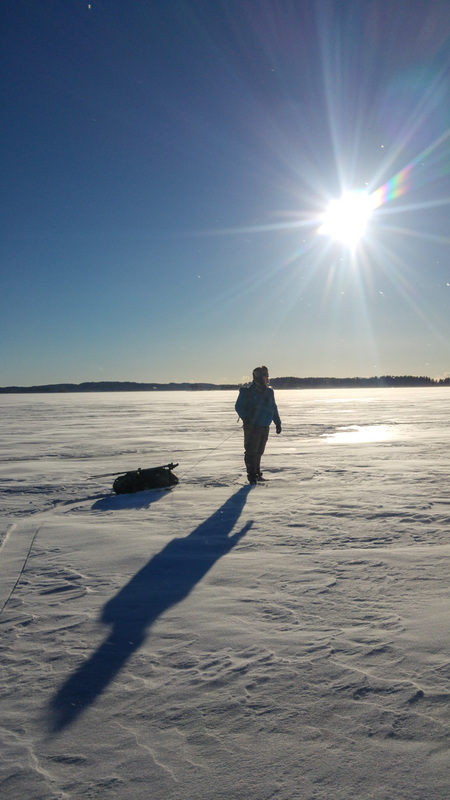 If you have time and the weather allows, then it’s worth taking a detour to the outer archipelago, for example via Stora Björkskar. But do check which islands you can land on during the summer on the national park’s general map . Many islands are protected due to nesting birds from 1.4-31.7. 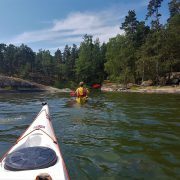 If you have experience paddling in the open sea, then reserve an extra day and paddle to Jussarö lighthouse island. 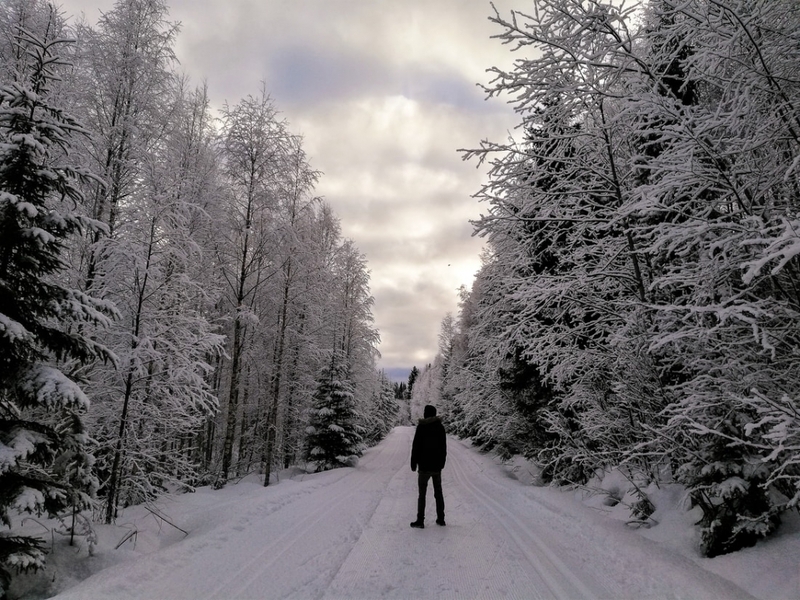 During our trip we stayed in the inner archipelago, and after Fladalandet our third island destination was Modermagan. It only takes about half an hour to paddle between the two islands, which we did easily in a light wind. Over the boat channel we paddled a bit faster. There was a lot of boat traffic around midday on the summer’s day. 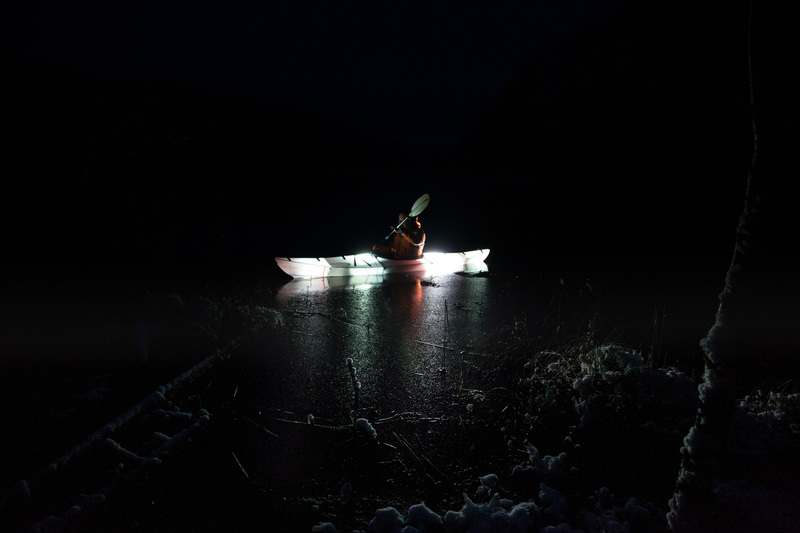 Being so close to the water’s surface, a kayak can’t necessarily be seen from a fast-moving motor boat, so paddlers need to take responsibility for themselves and be aware of boats. On the southern side of Modermagan, a bay opens out from the inside of the island, into which we paddled. 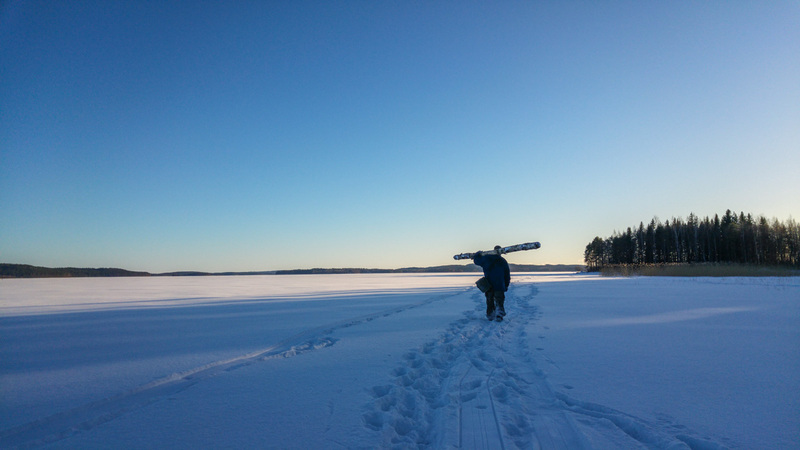 We got some advice on where to shore from a couple of paddlers coming towards us from the opposite direction. At the base of the bay, behind the last reed bed is a shallow beach, which is hidden by the reeds. 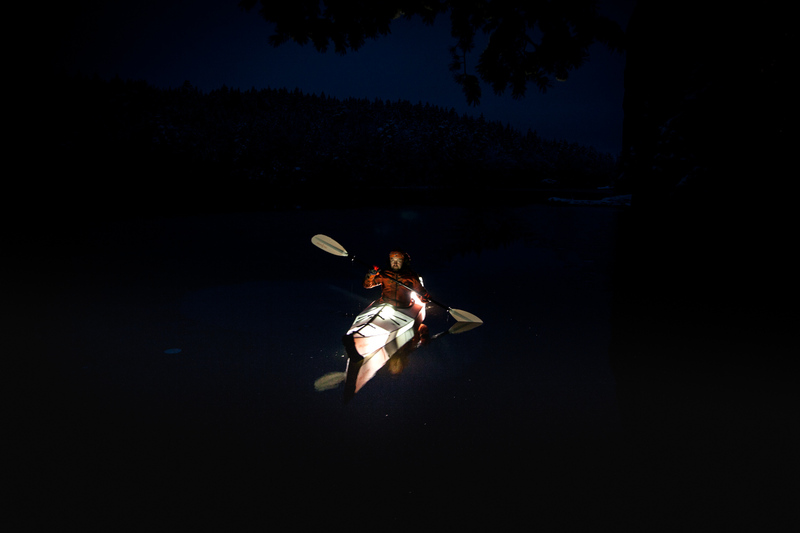 If you keep paddling along edge of the rocks nearest the reeds, you will find a place to come ashore. The bay has sheltered places for boats, and even the tent spots are out of the wind. There’s a nice atmosphere on Modermagan. It’s a laid-back holiday island, where you can stay and swim and enjoy camp life for a second day if you wish. 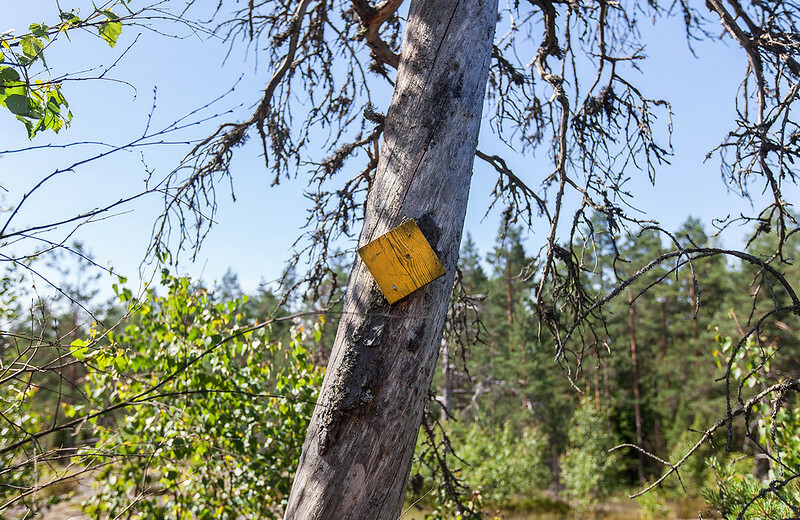 We headed out onto the nature trail, which amused us with its signposts. I don’t know who writes and illustrates these, but thank you wherever you are. The sign about mosquito’s paradise made us laugh. 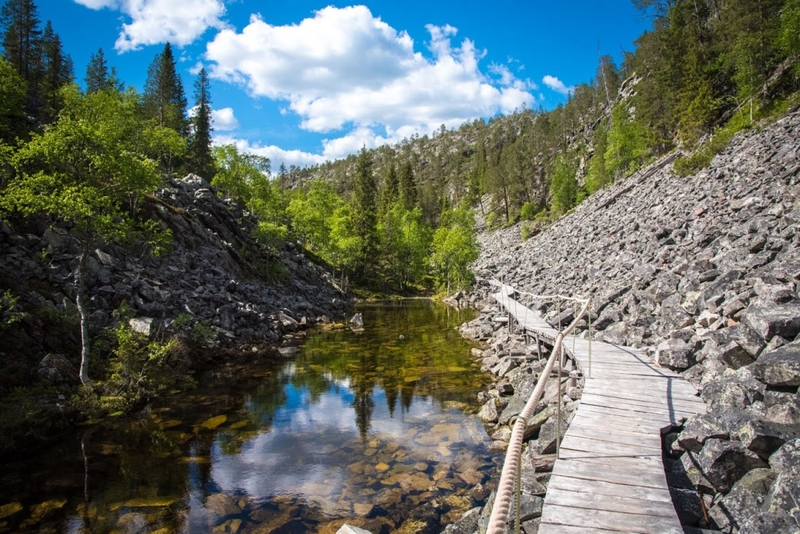 Both Modermagan’s and Älgö’s nature trails are easy to follow. 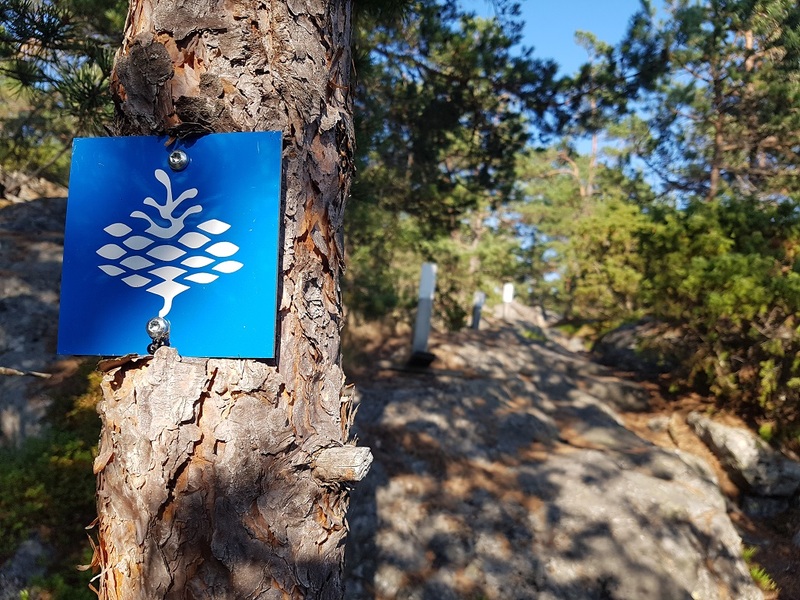 The Rödjan trail on Älgö is marked with blue pinecone shields and Modermagan’s with white wooden posts. 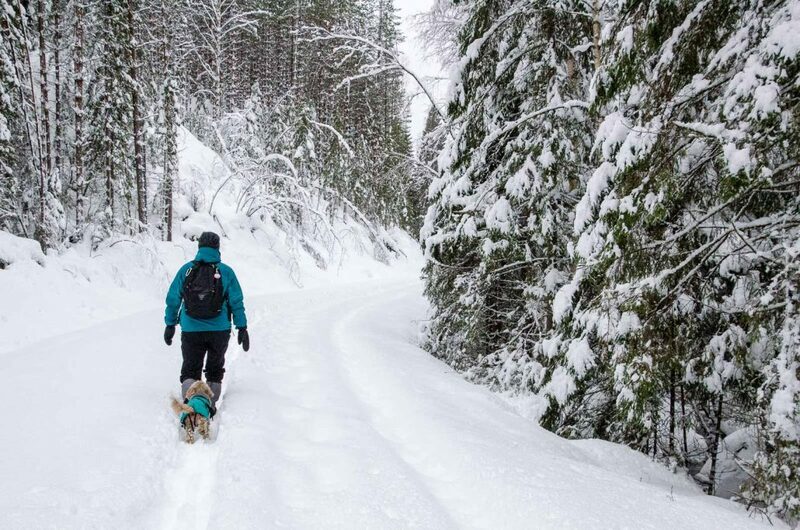 Both trails are quite hilly and demand good basic fitness as well as healthy feet. Just as we thought that Modermagan’s nature trail had ended, a pond appeared in front of us. I’ve never seen so many waterlilies. Archipelago nature is usually quite rocky and bare, so this lily pond stuck out by contrast. It was as if in a fairytale. The only thing missing was a frog prince looking for his princess. You can also swim in the pond, something that we tried and tested. We went back to our kayaks, had a light meal and exchanged greetings with some boaters. Afterwards we paddled back along Älgö’s east side. In calm, favourable conditions, the journey should only take an hour and a half. Our car was waiting for us at Sommarö Stranden. We emptied our kayaks and lifted them onto the roof of the car. With our souls feeling so fully restored and recharged, it felt like in only two days we had experienced two weeks of summer and archipelago. In my mind the best way to spend a free afternoon is to go outside and enjoy the nature, so this is what I decided to do on a beautiful sunny day. 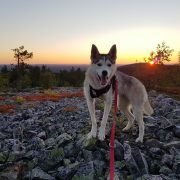 I packed my stuff, prepared my dogs to go on another adventure and headed to the national park of Pyhä-Luosto. 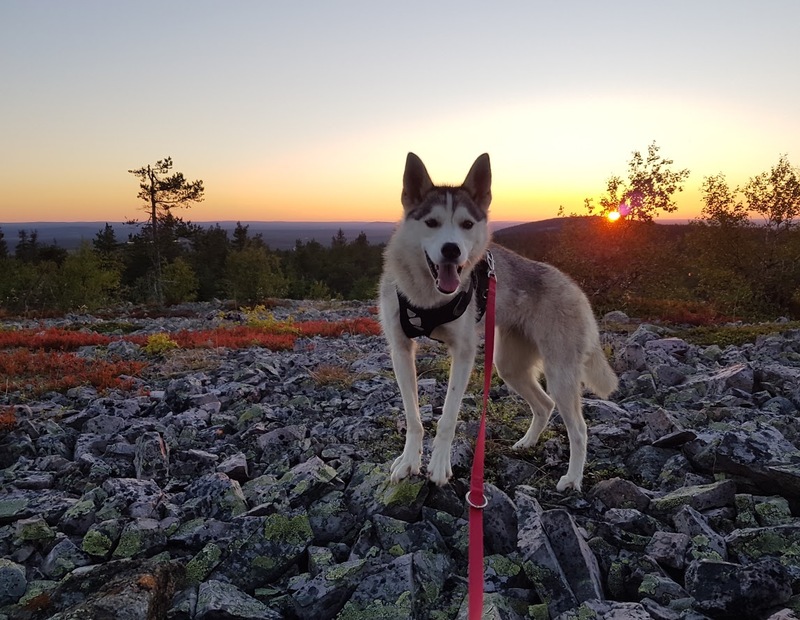 We started at the Rykimäkero parking area and from here we followed the Rykimäkero trail (more information about the trail and how to get there can be found below). On the trail there is located an amethist mine. 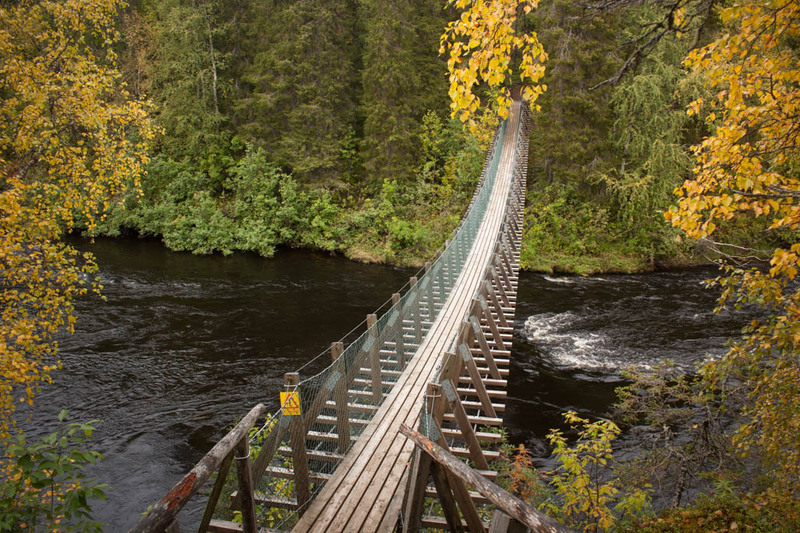 If you are planning to bringing it a visit, this trail is a perfect way to get there. But remember to check their website for the opening hours before you make your way there! 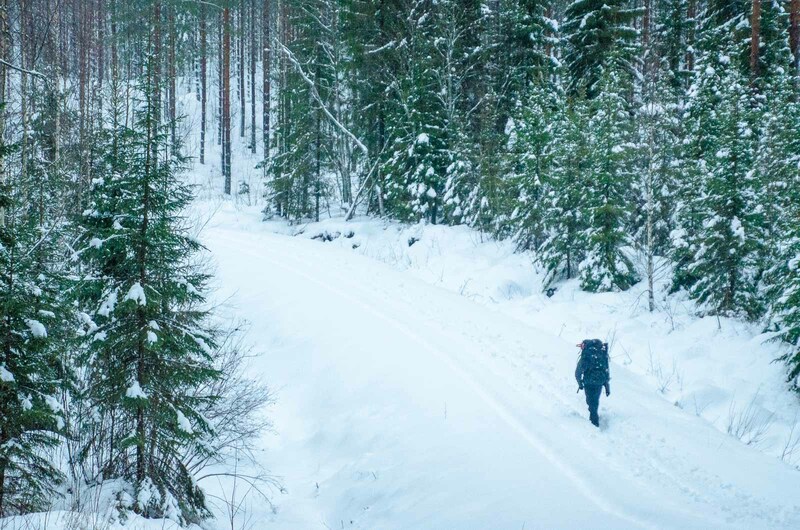 By following the trail you will come across different kinds of paths and parts of the forest. One moment your are making your way through the swamp on some duckboards, and the next you are following a dirt road between the trees. 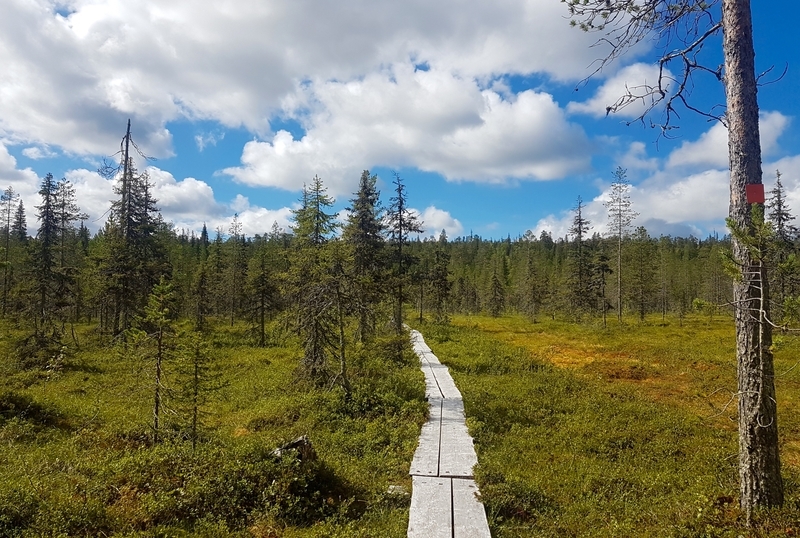 But this is what makes the trail so special: the changing scenery makes you experience the different aspect of nature that Lapland has to offer. 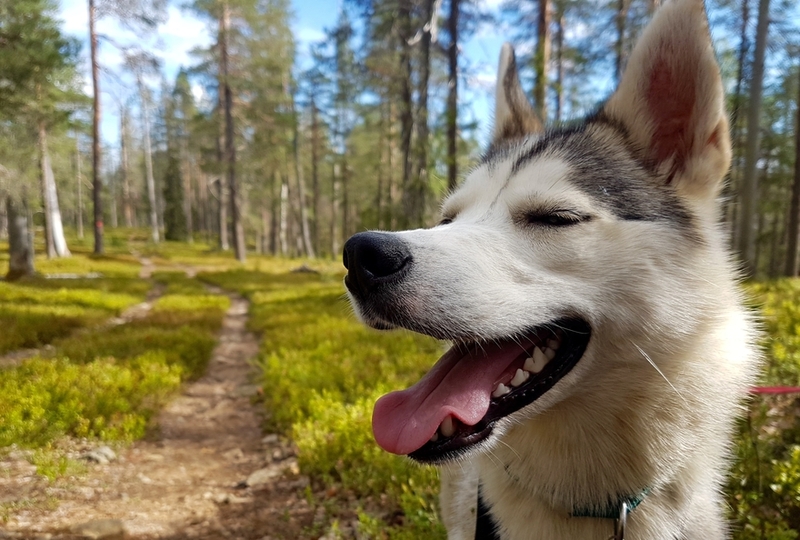 During the hike my dogs suddenly got restless. 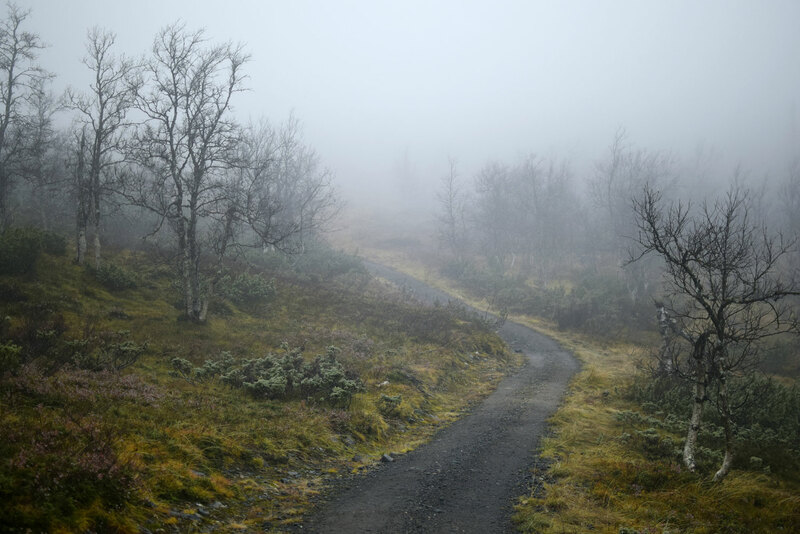 They started sniffing every little leaf and rock that crossed their path, hoping that it will give away the location of the thing that leaves behind a certain scent that they had picked up on. 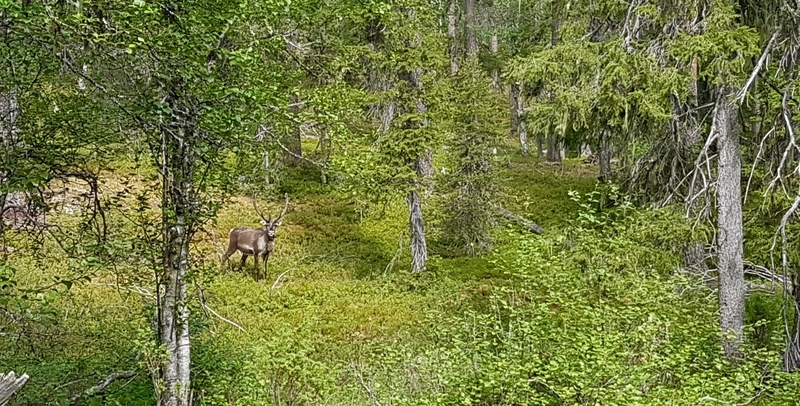 It only took a couple of meters until a reindeer decided to pop out from between the trees. It happens quite often that we come across these beautiful animals during a hike. Sadly, my huskies don’t have the best intentions when meeting these creatures, so we had to move on pretty quickly. 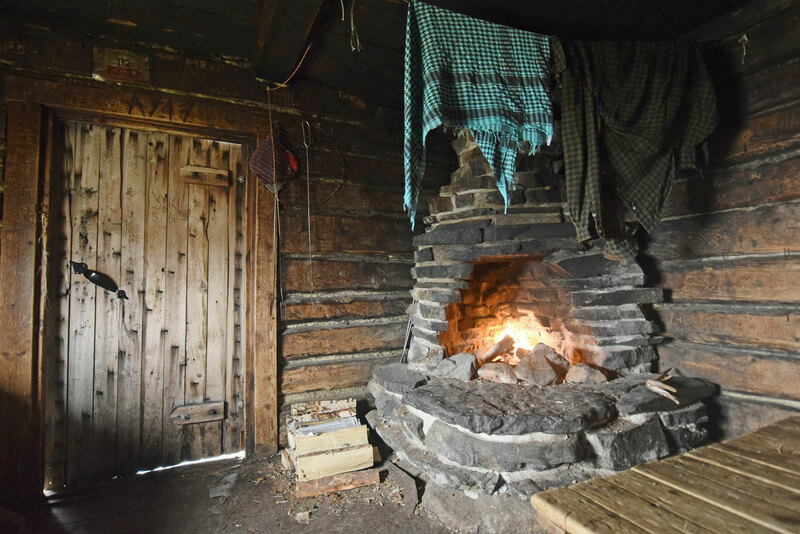 Along the trail there are a lot of shelter places where you can make a fire, enjoy some lunch or just take a little break. Just remember to leave everything the way you found it, without any waste or damage, so we can enjoy these shelters for many years to come! During one of our breaks a couple of siberian jays decided to give us a little show. They flew from tree to tree and made it look like they were dancing in the sky. Sadly I didn’t have the right equipment to get this photographed. But if you are lucky and quiet, you might experience this as well during your visit! 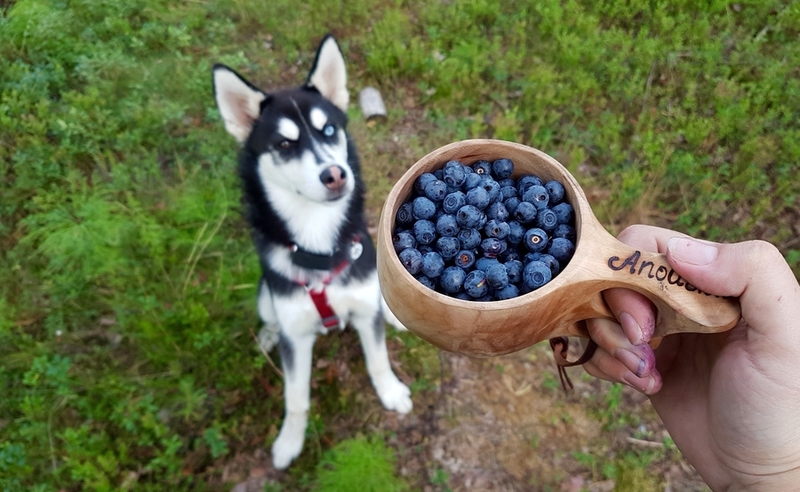 During my hike there were a lot of ripe bilberries and cloudberries at the side of the trail, so we decided to pick some as a snack and to bring home. 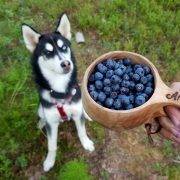 My huskies think of the bilberries as nature’s free dogtreat, which makes it a little harder to actually have any berries left to bring home. 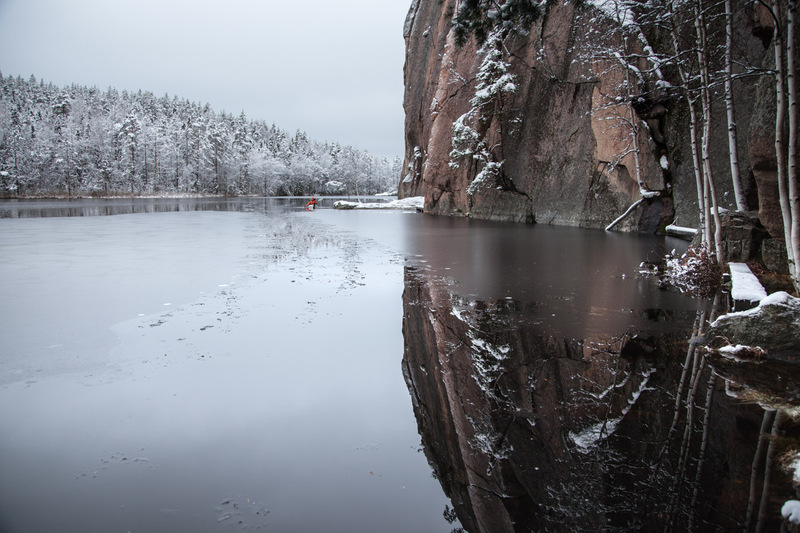 Close to the end of our hike we came across the gorge of Rykimäkero. This gorge originated when the rockbed started to tear. It’s a beautiful place to sit down and take some time to admire the power of nature. 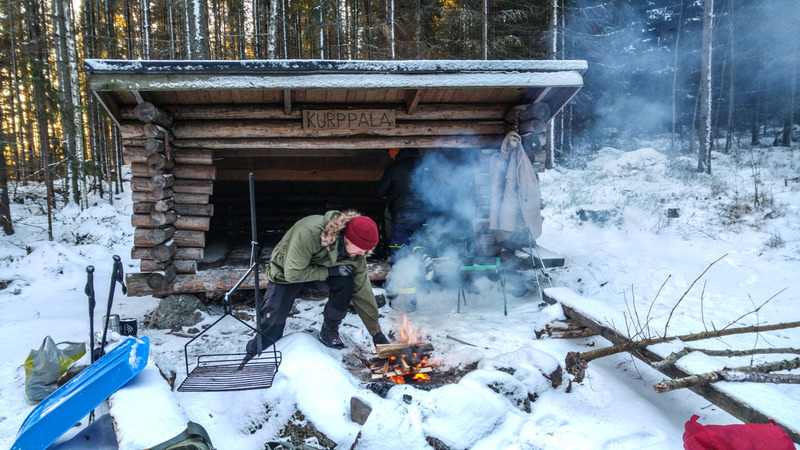 There is also a shelter, named Rykimäkuru, next to the gorge. After this our hike came to an end. We were all satisfied by the things we had seen and experienced and can’t wait for the fall colors to start showing. Then we will follow the same trail once again and enjoy the beauty that autumn season gives us. 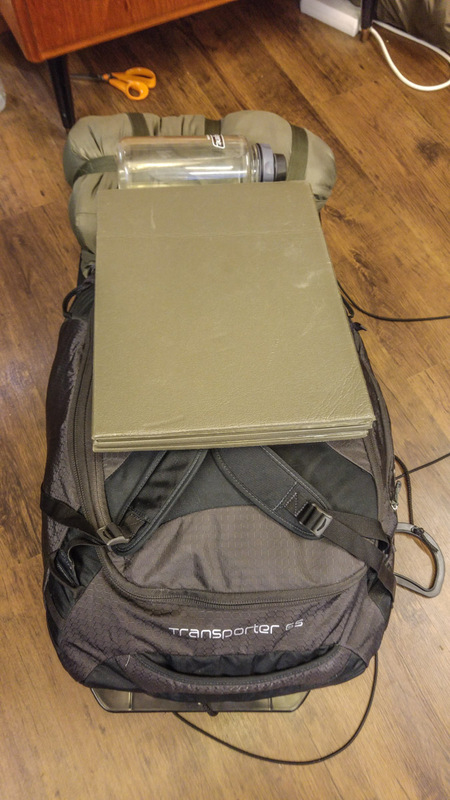 I like to use this pdf-map to find my way through the national park. All the shelters and rest places can also be found on this map. 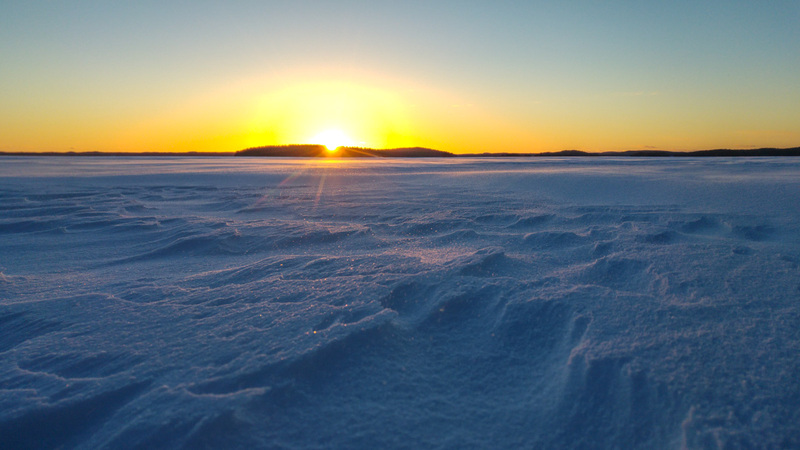 If you visit Lapland in summer you can’t get around it, the midnight sun! 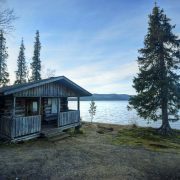 It’s an amazing natural phenomenon above the arctic circle that brings us daylight for 24 hours a day during a big part of summer. This is because the sun doesn’t set for a couple of days or weeks (depending on your location). It’s really special to experience the midnight sun for the first time, my first time wasn’t that long ago! 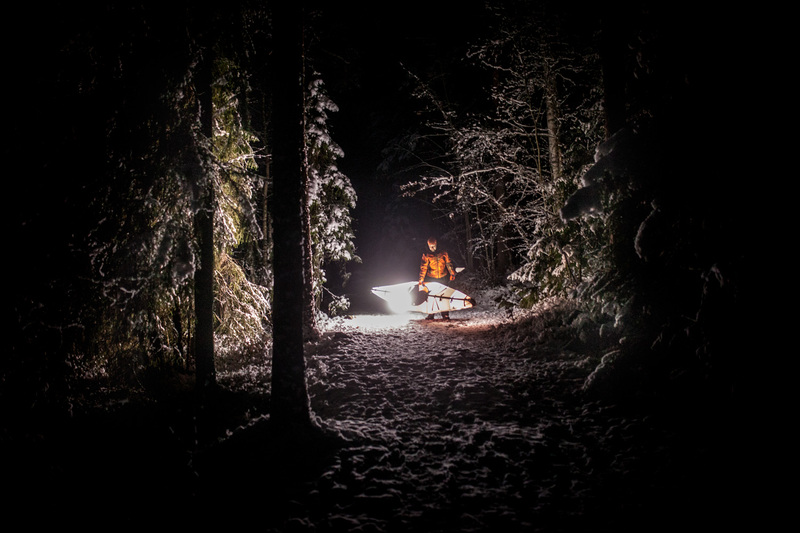 You feel revived and full of energy, especially after the dark and cold winters we have here in Lapland. 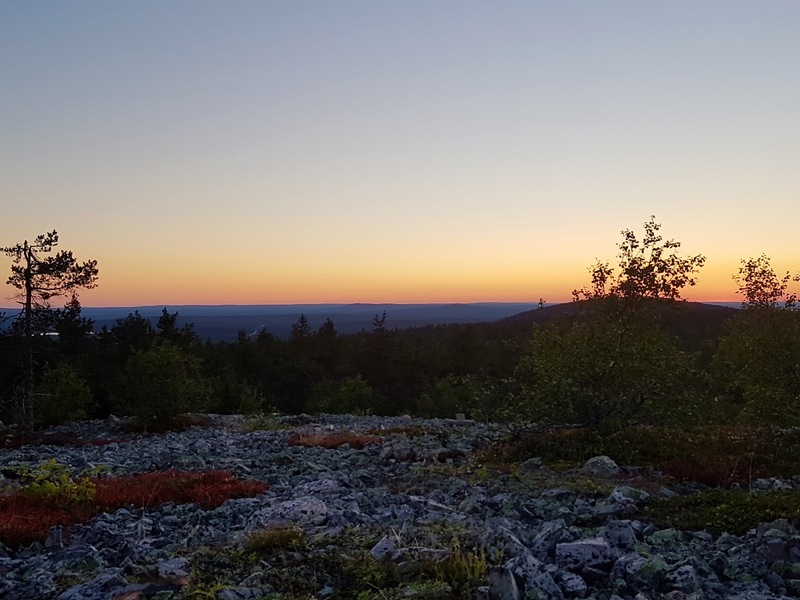 Even though the midnight sun is really special, it’s also a special time when the sun will set again, so I decided to take a look at it from the mountains in Pyhä-Luosto national park. 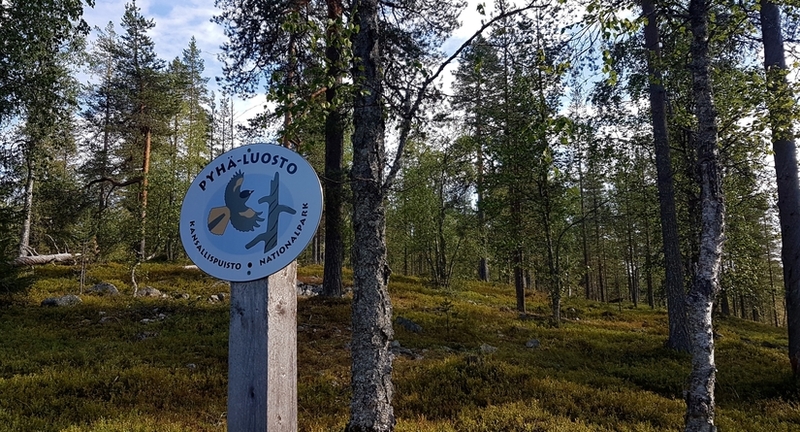 I know my way around the area and the trails and decide to take my favourite hike up the hill, following the Luosto nature Hiking trail ( more information below). The beginning of the trail isn’t that scenic but after about 10 minutes the views are only getting better by every step you take. 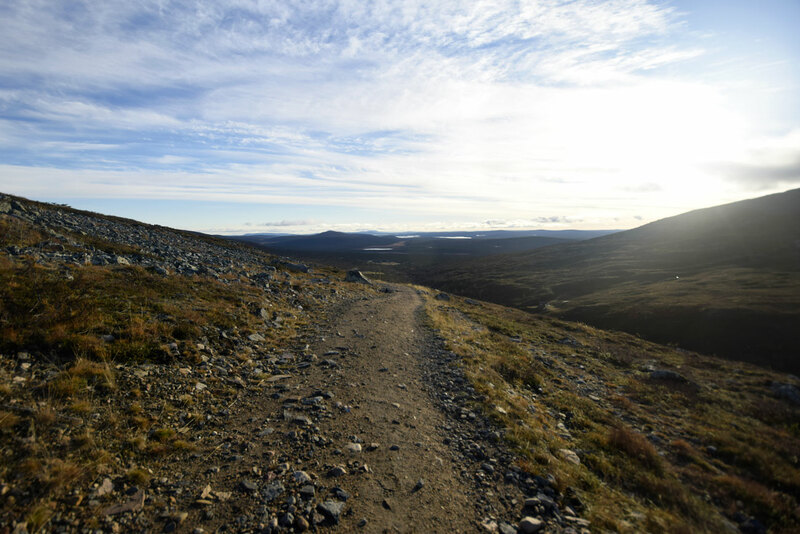 The trail can be quite steep and rocky but it’s totally worth it once you see the view. During the hike I could just hear the paws of my dogs making their way through the bushes and over the stones just making their way to the top with me, not knowing what was waiting for them. 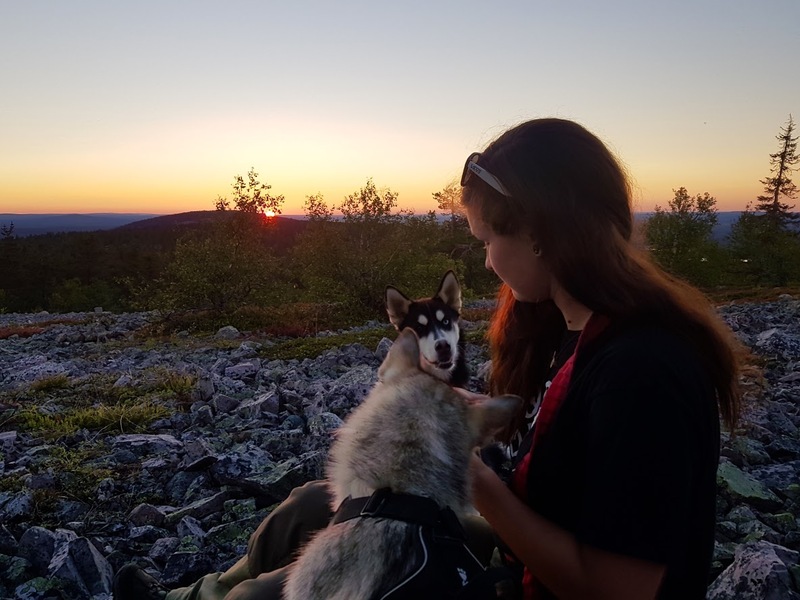 Once me and my dogs arrived at the top we took some time to rest, get some treats and enjoy the view and sounds of nature while waiting for the sun to set. Once the sun had set we made our way back down through the same trail that brought us to the top while keeping the beautiful views in our minds. And realizing that winter is just around the corner again. Then we can enjoy the beautiful Northern lights at the exact same spot. 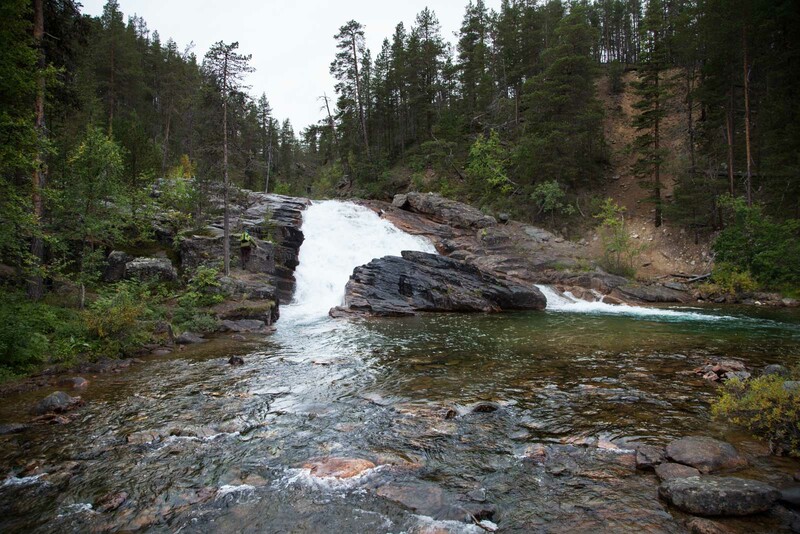 Information about the national park, how to get there and the trail can be found here. I personally use this map! 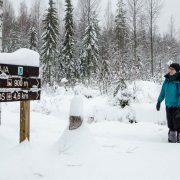 The trail I followed (until the top is reached) is called Luosto nature Hiking trail 18km, green colour. 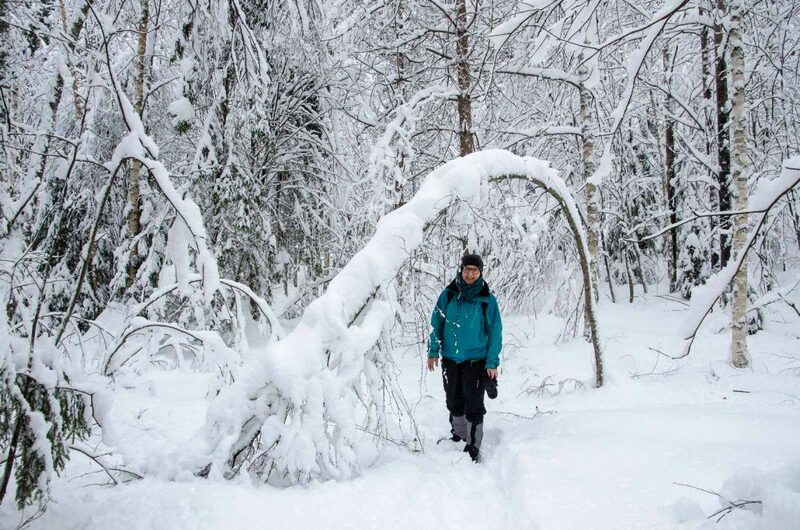 I had packed two pairs of snowshoes in the car just in case, but the path trodden in the snow seemed easy enough to walk without them. 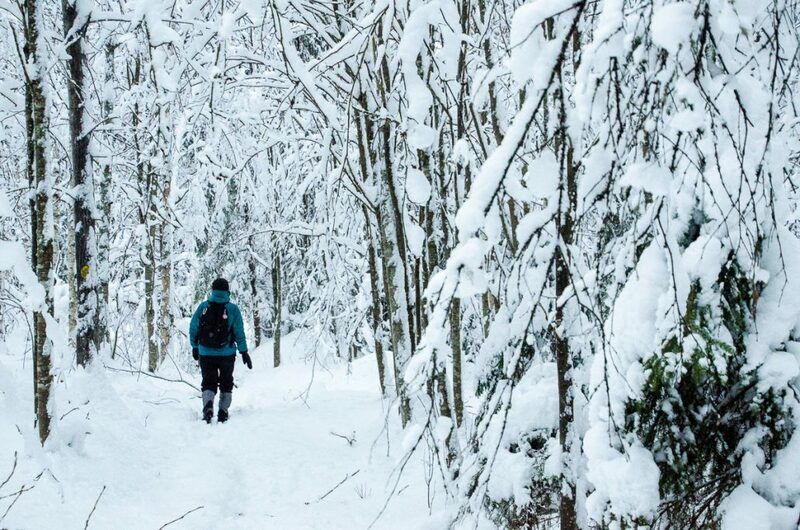 We just added garters to protect our boots from snow and started following the narrow trail. The forest around us was simply magical. 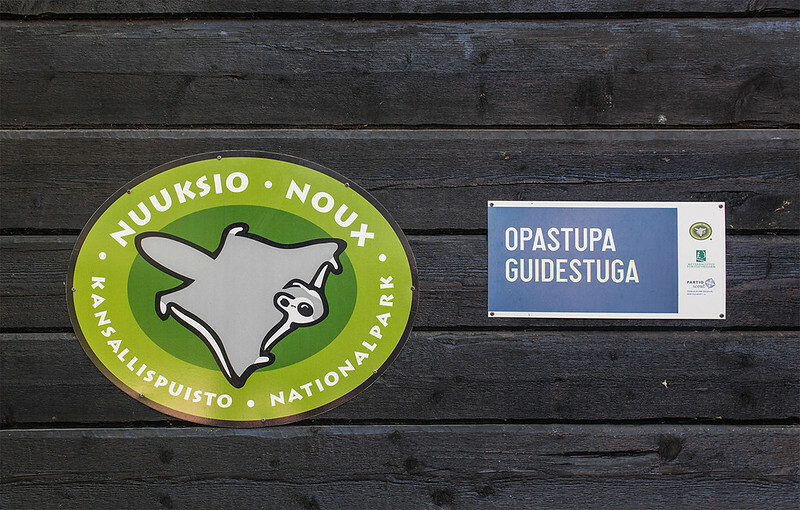 After inspecting the trail information at Kalaja parking area we stepped onto the Vuori-Kalaja trail. 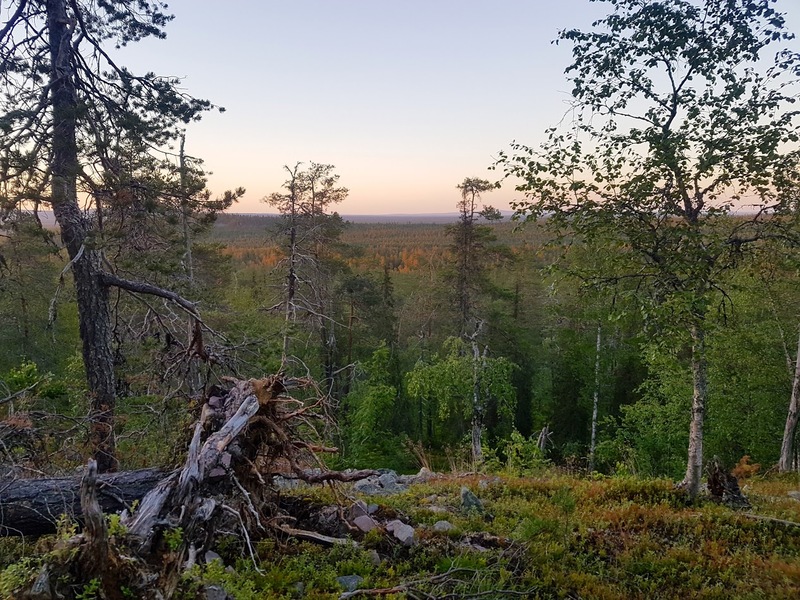 From this spot it is only 900 meters’ walk to Vuori-Kalaja lean-to and campfire site. 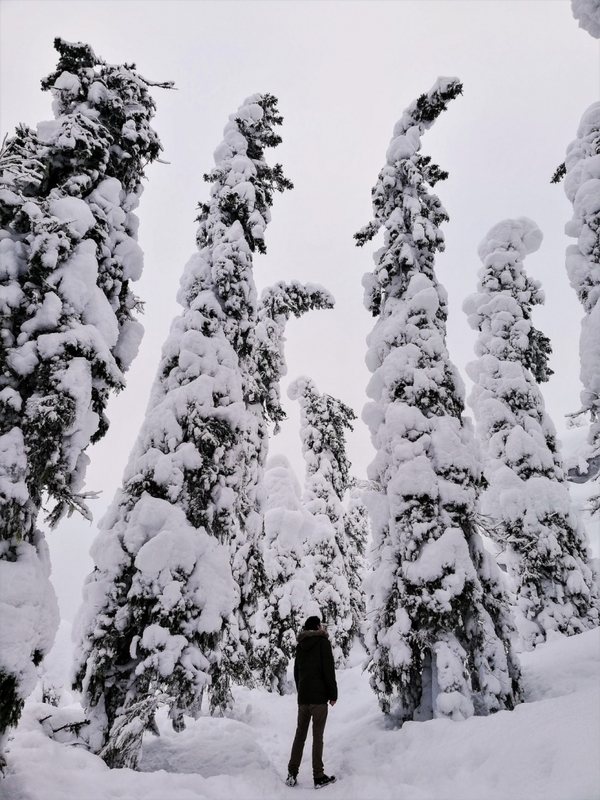 That’s when we really felt like stepping into the winter wonderland! 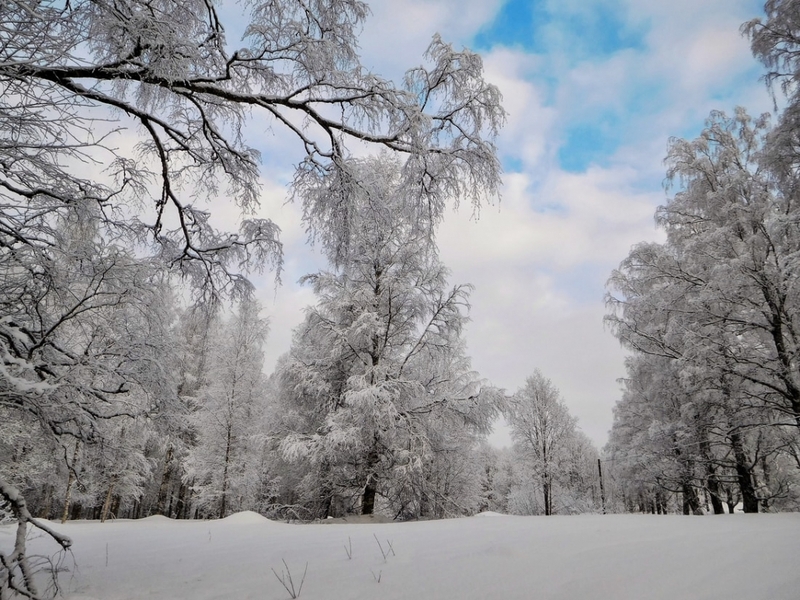 The snow covered birches, alders and firs all around us were simply amazing. Nature’s own sculptures! 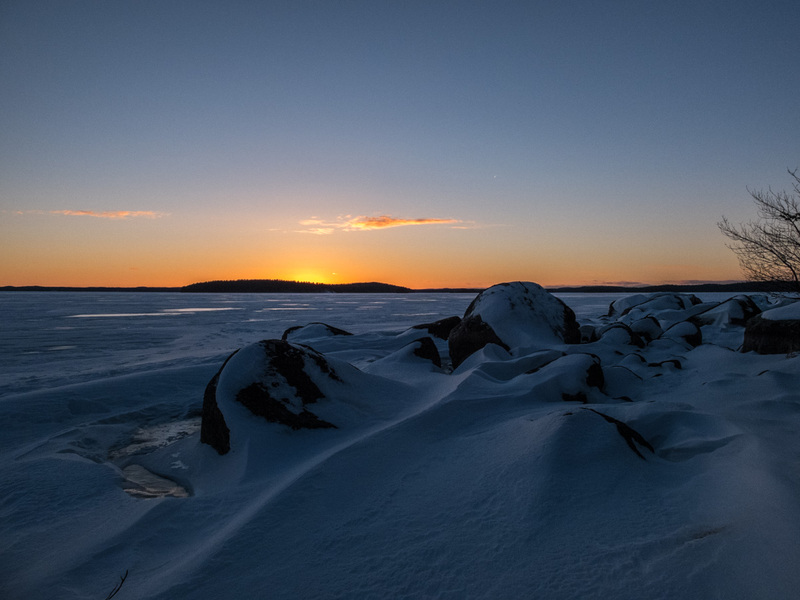 However, soon it was time to head back to the car and return to city lights, and enjoy the last minutes of winter magic in daylight before the drive home. 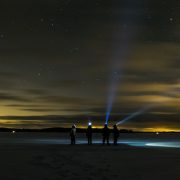 This article has been previously published at visitcentralfinland.com.